During our last night, I had the Third Assistant Engineer, Steve Clement, give me a tour of the engine room and fresh water system. I can’t believe the engineers are able to work down there – the noise and heat (110°) is amazing! 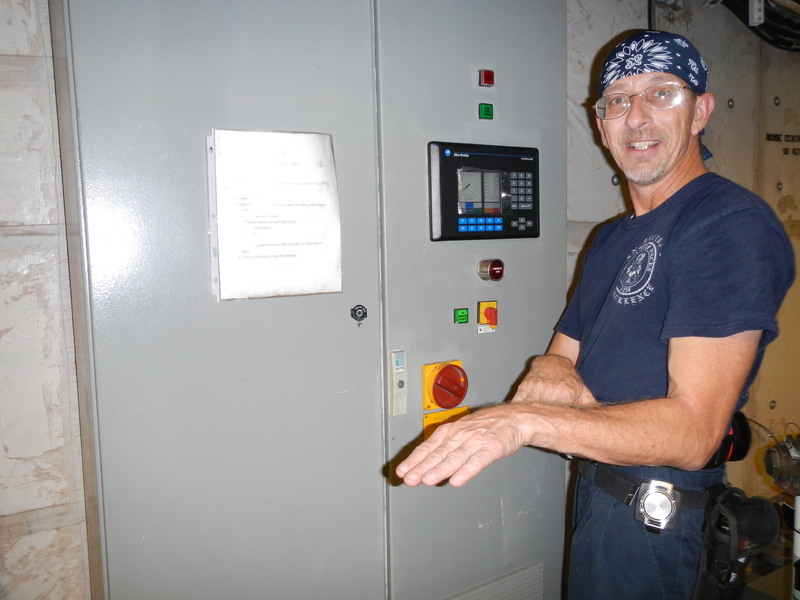 Steve Clement, Third Assistant Engineer, explaining how things work in the engine room. I’m not a mechanically oriented person, so Steve had to keep his explanations short; it was more of a show-and-tell tour. 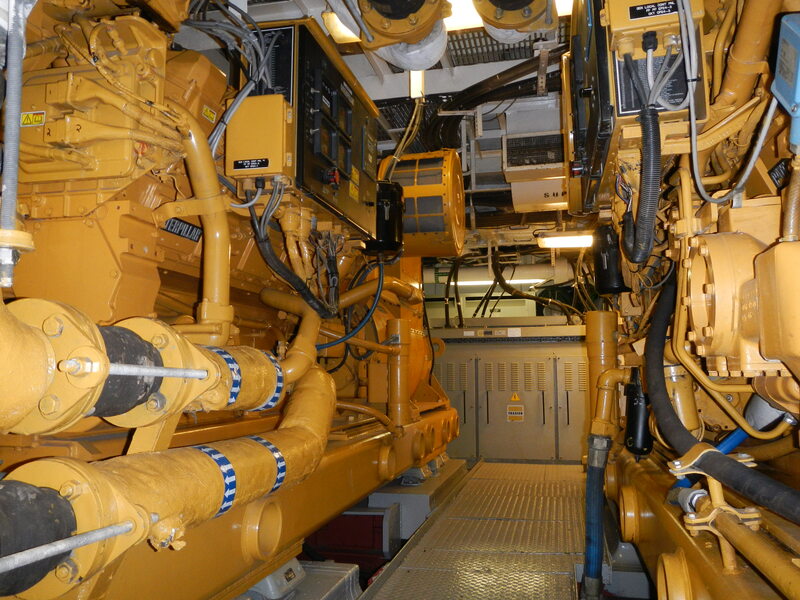 The engine room, majority of equipment controlling the ship’s motion, and water treatment are located on the bottom deck of the ship. The quantity of both electronic and mechanical equipment is mind-boggling; all the men who work in this capacity have to be proficient in so many areas so the ship can support the science missions. Hats off to all those hard-working and talented men! 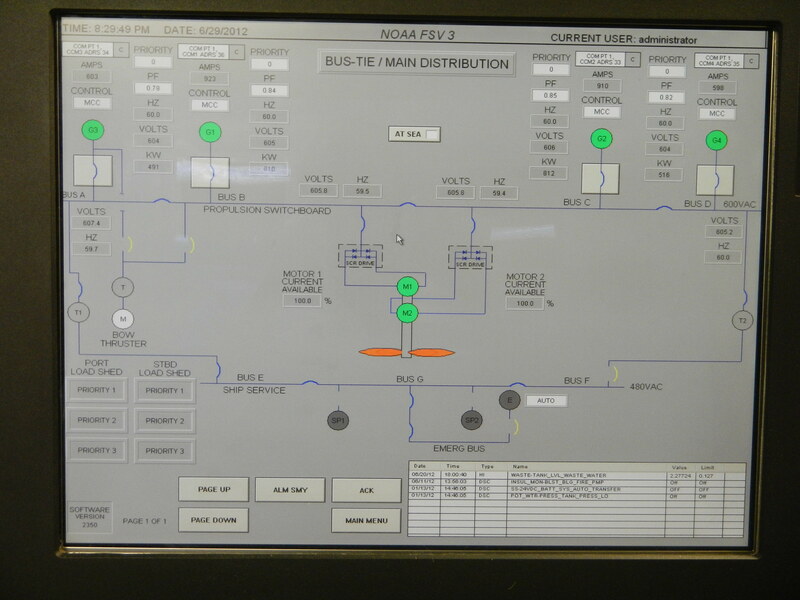 Computer screen showing the operations in the generation plant on the Pisces. 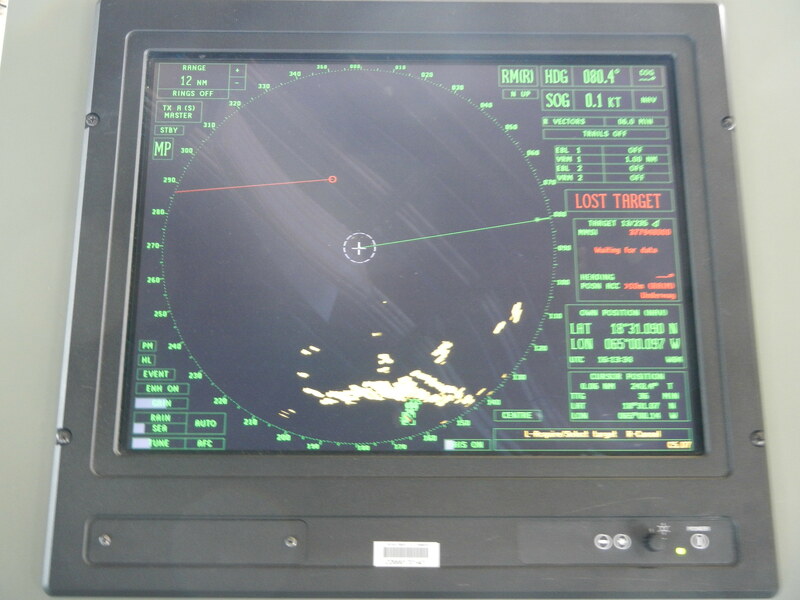 The operation of the ship can be monitored on the main distribution computer screen. Levels of fluids and functioning of all the components are continually assessed and modifications to operation made from the control panel. 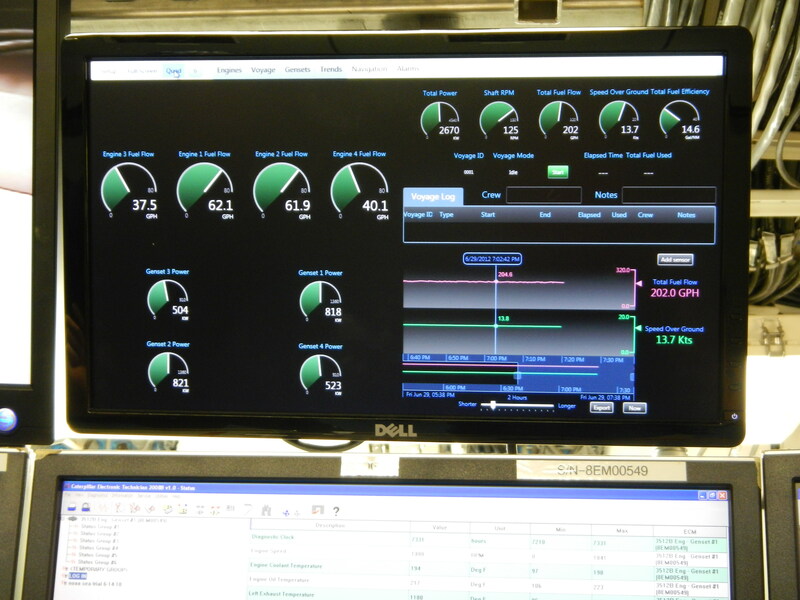 Computer screen showing current fuel consumption for each generator. 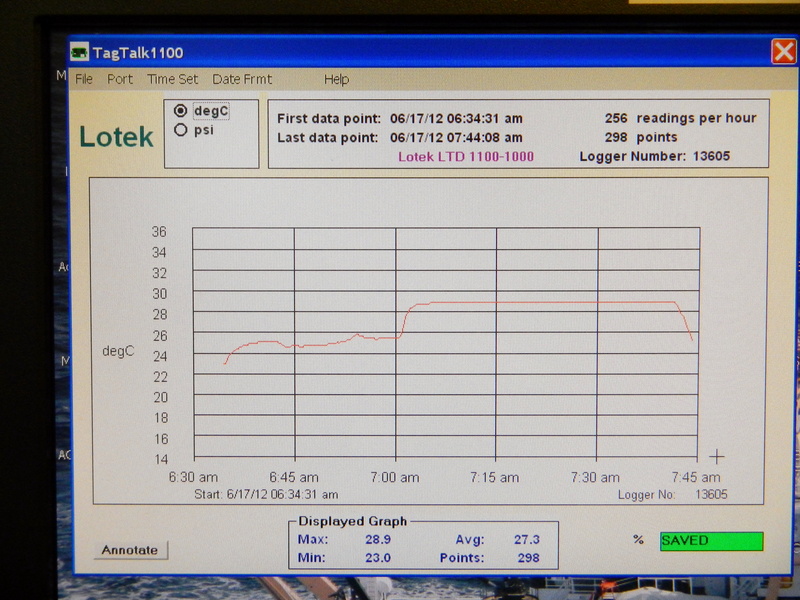 The ship uses lots of diesel fuel when it is operating at full steam (14.5 knots/hour) – around 2,500 gallons a day! The Pisces has a tank capacity of 110,000 gallons; I’d hate to pay their fuel bill when it’s time to fill up! This quantity of fuel allows it to travel about 12,000 NM (nautical miles) or 13,800 miles; that’s a little over half-way around the Earth on one tank of fuel! Two of the Pisces‘ generators: the one on the left is a 12-cylinder and an 8-cylinder on the right. The propeller is located at the stern (back) of the ship. 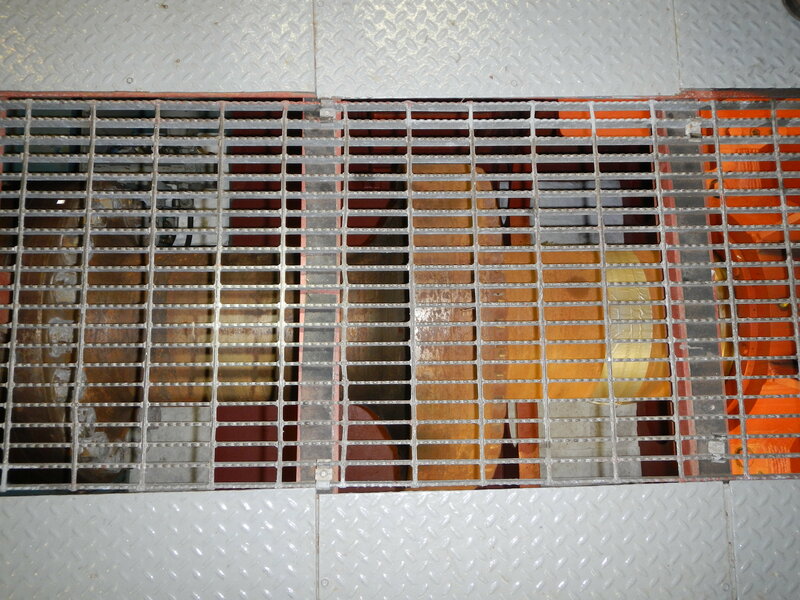 I was able to look down through grating in the floor and see the drive shaft turning at 134 rpm. It has a diameter of 14.1 feet; it has to be so large so that it can efficiently move the ship through the water. Main shaft of the Pisces‘ propeller. Lastly, I got to see the Pisces‘ water generation system. This is as important as the ship’s engines because without fresh water, the scientists and crew members wouldn’t have drinking water as well as no water for washing or cooking. The ship isn’t big enough to carry all the freshwater that it needs for a long cruise. But with reverse osmosis technology, and the fact that we’re surrounded by nothing but water, fresh water is readily available. The Pisces takes in seawater which is pumped through a reverse osmosis (RO) system. Reverse osmosis (RO) system that creates fresh water for the Pisces. In reverse osmosis, the salty water is forced (pumped) through membranes with very small openings. 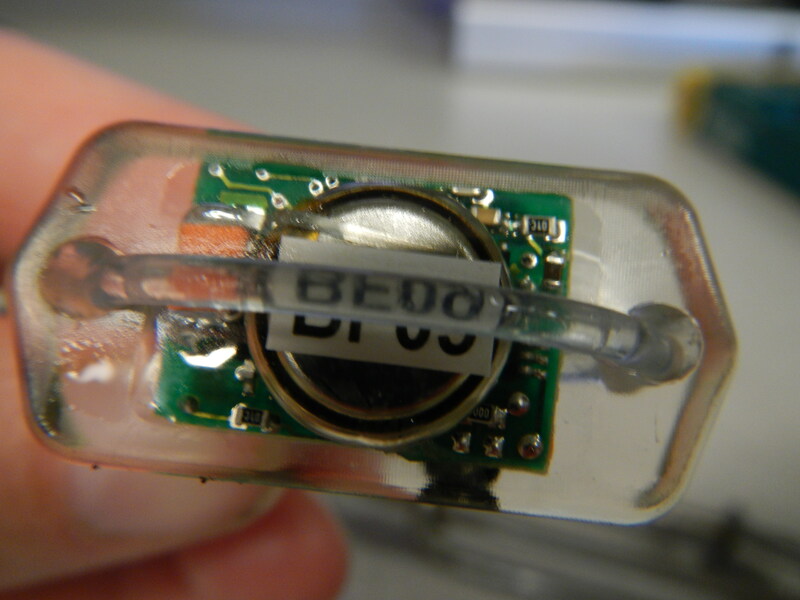 These are so small that the ions making the water “salty” cannot pass through; the water is able to pass and after leaving the ions behind, becomes fresh water. 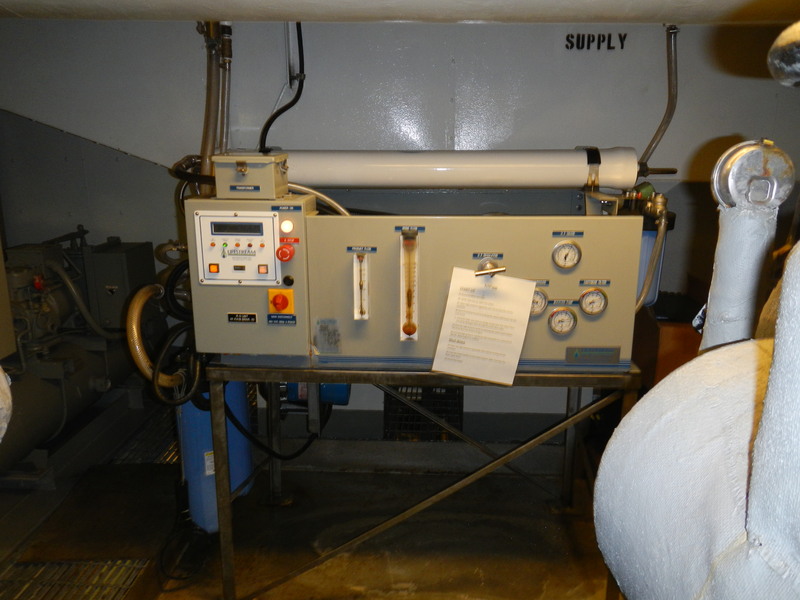 The RO system on the Pisces generates about 624 gallons per hour. The tan “box” in the picture above contains all of the controls and gauges. 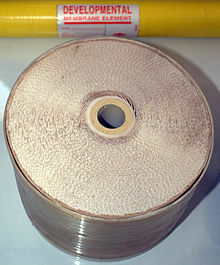 The long, white tube behind it contains the permeable membrane that the water is forced through. 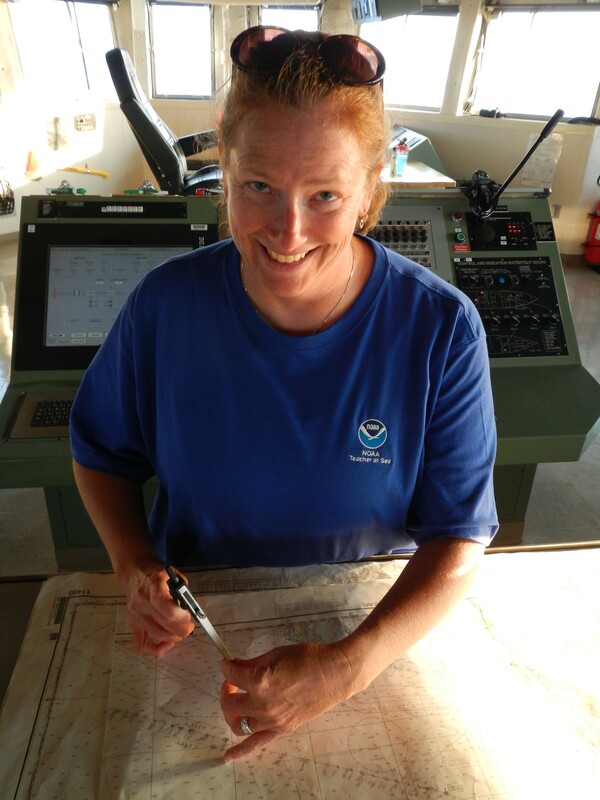 It is with some sadness that my adventure as a NOAA Teacher at Sea has come to an end. Today I said goodbye to the crew of the Pisces. 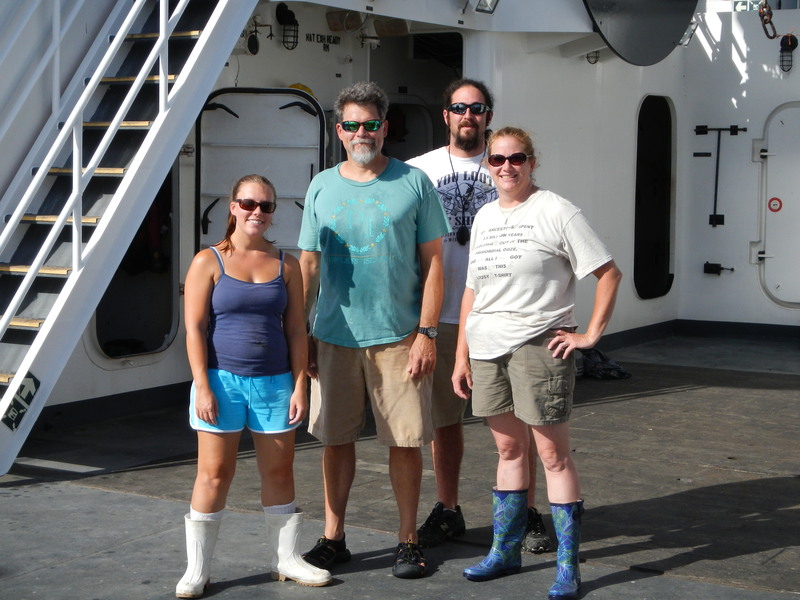 They are an amazing crew, and made my final portion of the cruise without the scientists interesting and fun. I admit that I was a bit apprehensive about being without the scientists and seeing the ship under different circumstances (lacking a specific scientific objective), but the Pisces steamed forward with two goals in mind: retrieving the buoy (see my last posting on June 27), and arriving in Mayport in a timely manner to receive the next group of scientists as they embark on their cruise. 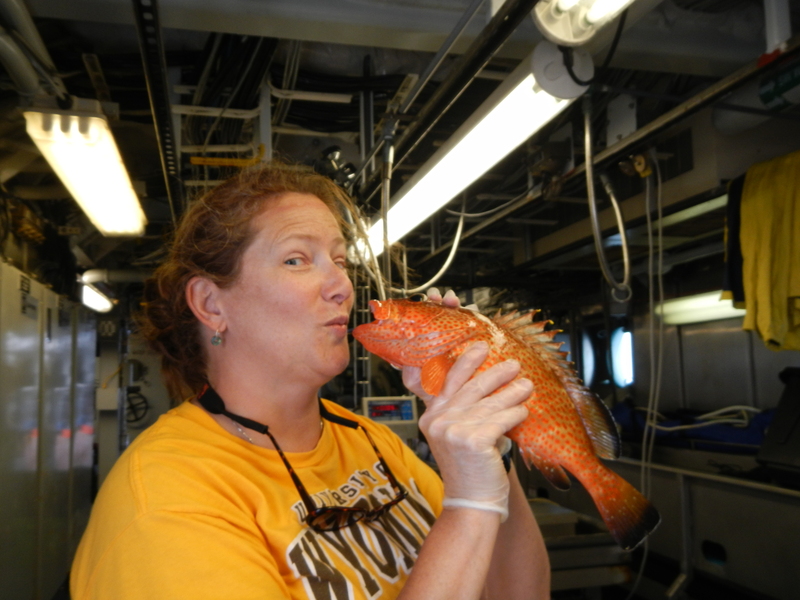 I’d like to invite you to continue to follow the Pisces and their new Teacher at Sea, Marsha Skoczek as she learns about Deep Sea Corals. On the afternoon of the 28th, we encountered a line of squalls generated by Tropical Depression Debby as she moved off the coast of Florida and into the Atlantic. At one point, we had 40 knot (46 mph) winds and rain. After the winds had died down a bit, I spent some time up on the bridge. Being up so high in the ship, coupled with 8-foot confused seas (waves coming in from different directions) began to make me feel seasick. I took another meclazine (similar to Dramamine), had some saltine crackers and ginger ale, and sat on deck looking at the horizon for a while. When even this failed to make me feel better, I crawled into bed. I really must have been feeling poorly to miss dinner! By next morning, the seas had calmed down dramatically, and I was feeling as good as new. As this was our last full day at sea, I headed up to the bridge to do one last thing that the Commanding Officer told me I could do – drive the ship! While the ship is underway, it is usually under “auto-pilot”. 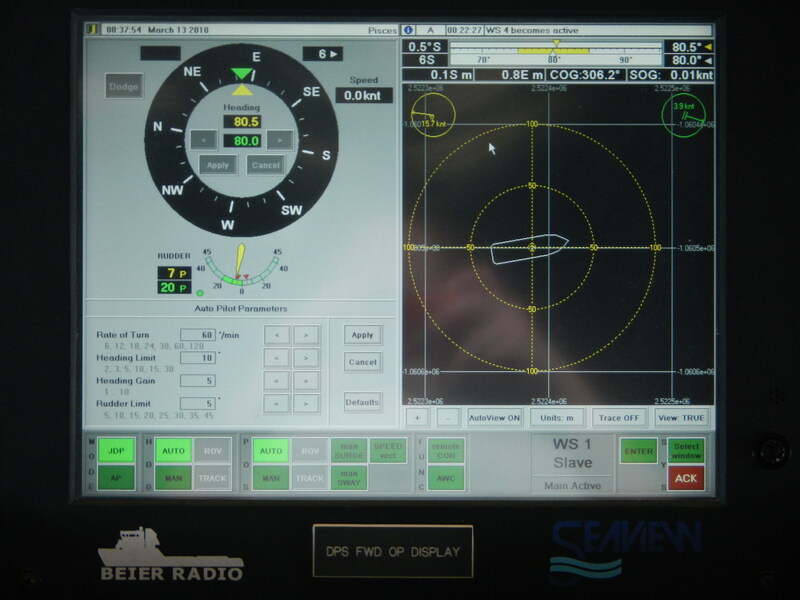 A course can be entered into the computer and the ship doesn’t need anyone actively at the helm. The Navigational Officer, Ensign Michael Doig, placed the Pisces under manual control and showed me how to steer the ship. The Pisces is an incredibly responsive ship and can turn very quickly in just a few feet. I was shown the current heading and the compass and tried to keep the ship on course – it was definitely much harder than it looks! After zig-zagging back and forth, off course by about 10 degrees, I handed control back to Ensign Doig. Lesley Urasky at the helm (aka “driving” the ship). After this concentration zapping task, he had me plot our current position on the navigational chart and record the hourly weather information. This included the ship’s current latitude and longitude, course heading, wind speed, air temperature, relative humidity, barometric pressure, and cloud cover. 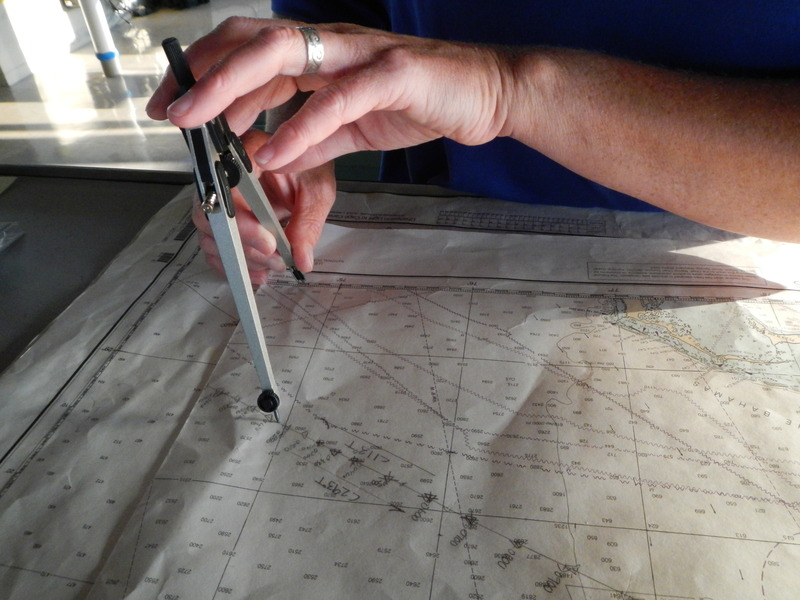 While many aspects of travel in the modern age have various computer based technologies to assist with navigation, the crew still needs to know how to find their location manually. 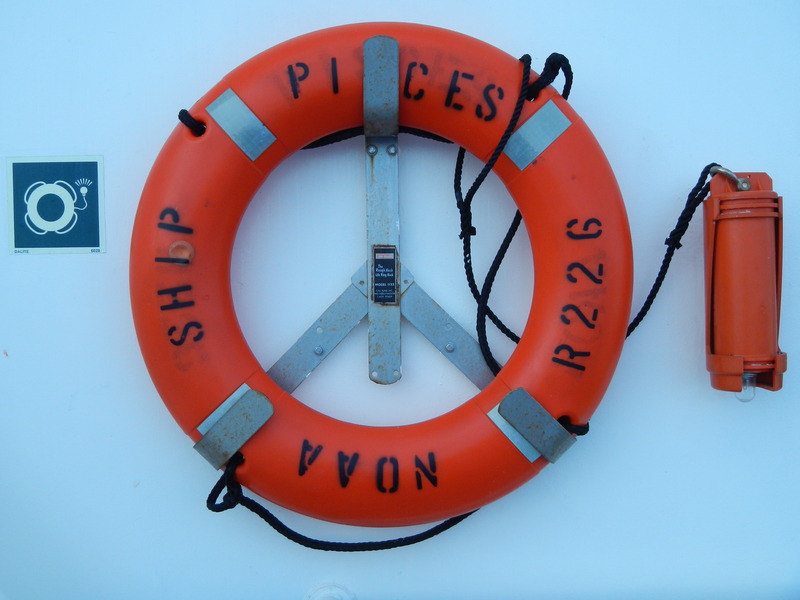 I spent some time learning about navigation with Peter Langlois, 3rd Mate on the Pisces. He showed me how they plot their course on a navigational chart. 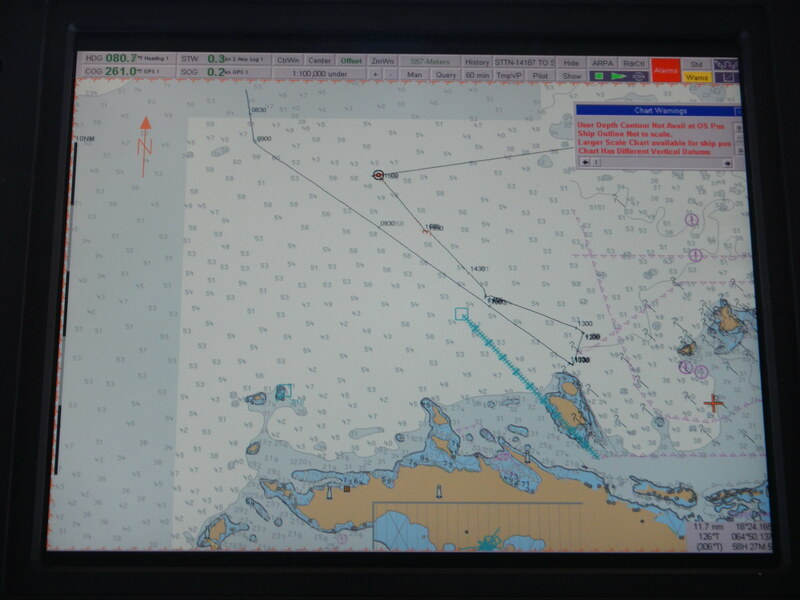 Once a ship’s current location is determined, those crew members on watch will use dead reckoning to determine where they will be at a given point in time if all the current conditions remain the same (course and speed). Peter also attempted to show me how to determine the time of sunrise/sunset for each specific location using our latitude, longitude, and an almanac. For an interesting way to determine when sunrise/sunset (as well as moon rise/set) for your specific location, NOAA has a great website called Solar Calculator. This site will also tell you when solar noon occurs (point where the sun is most directly overhead) and show you the path the sun takes across the sky. 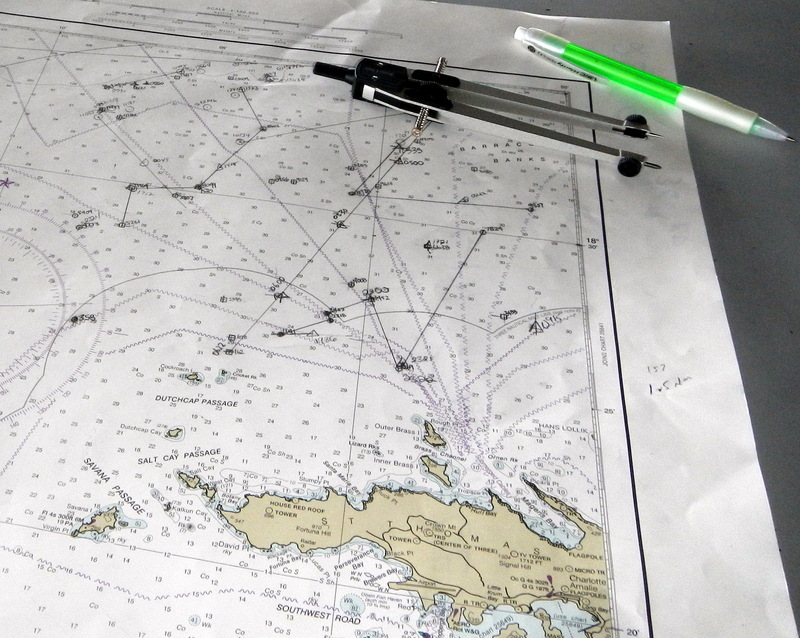 Plotting our current position and using dead reckoning to project future positions. Unfortunately, at that point in time, I wasn’t able to fully understand Peter’s directions as the seasickness was just beginning to hit me. The effects were compounded by being up on the bridge (almost the highest point on the ship) and trying to follow lines of small numbers in the almanac while the ship was being buffeted by waves from all directions. As my final day at sea came to a close, I spent quite a bit of time “prowling” the ship and taking pictures of all the little things that had become so “ordinary” to me. After dinner, I climbed up to the flying deck and spent time watching the sunset with the Commanding Officer (CO), Peter Fischel. It was a beautiful sight; one that I’ll always remember. 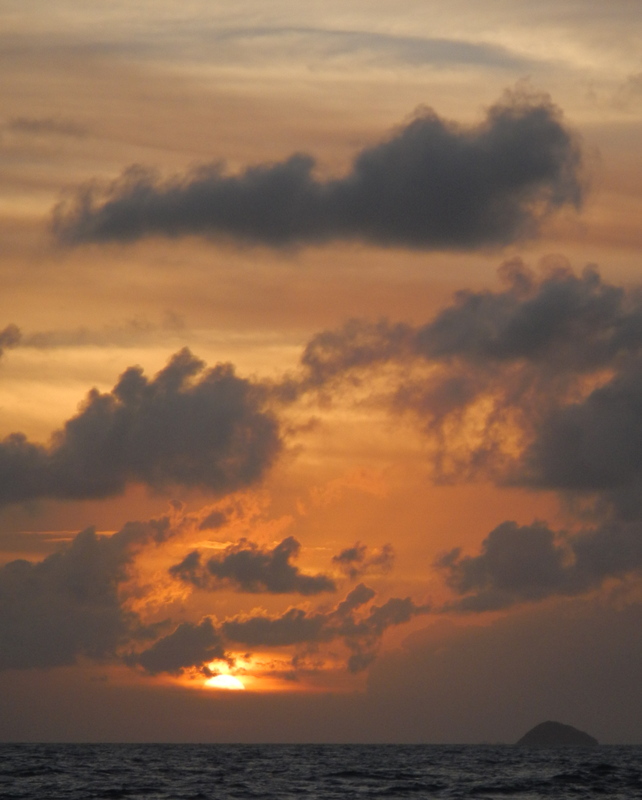 Sunset on the last night of the cruise. Before I went to bed, I checked the ship’s information board to find out when we’d be arriving in Mayport, Florida. 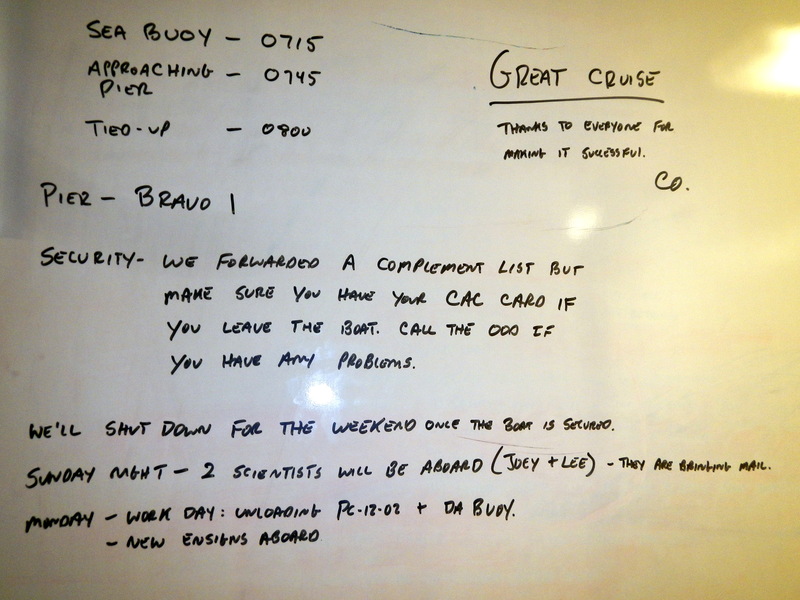 The board holds important information and updates the crew needs to know as part of their jobs as well as other useful information. Information board on the NOAA ship Pisces. Last night when I went to bed, there was nothing but open ocean surrounding the ship. When I woke up the next morning, the sun was rising and Mayport/Jacksonville, Florida could be seen along our port side (left). It was a welcome sight after not seeing land for a few days. However, I knew this view was also bringing my adventure to an end. It was an amazing journey and full of wonderful experiences. I met so many kind and knowledgeable people who I won’t soon forget. 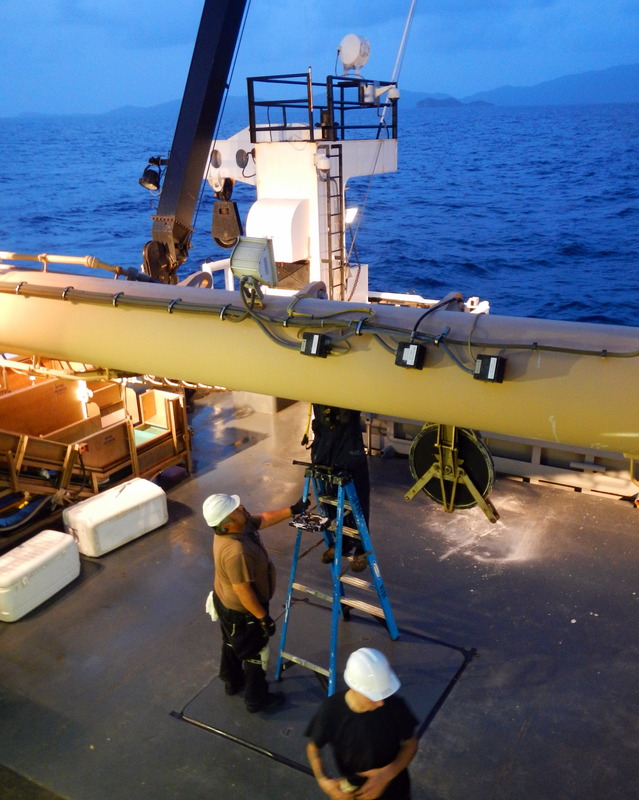 A HUGE thank you to NOAA, the science team, and the crew members of the Pisces! Panoramic view of the Mayport Harbor as we pull in at the end of our cruise. Today the Pisces had a mission that they don’t normally take on. 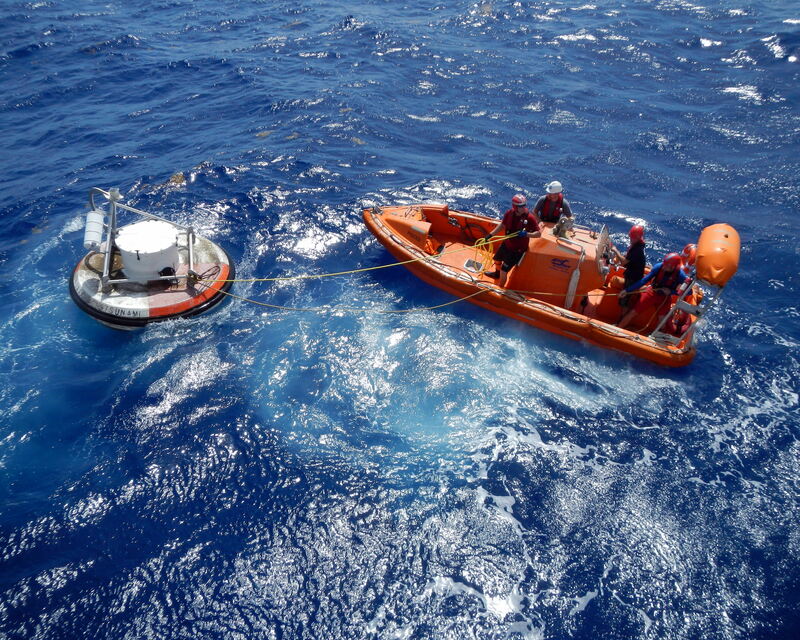 The goal for today was to recovery a Deep-ocean Assessment and Reporting of Tsunamis (DART) transponder buoy that had come detached from its anchor and was drifting with the currents. 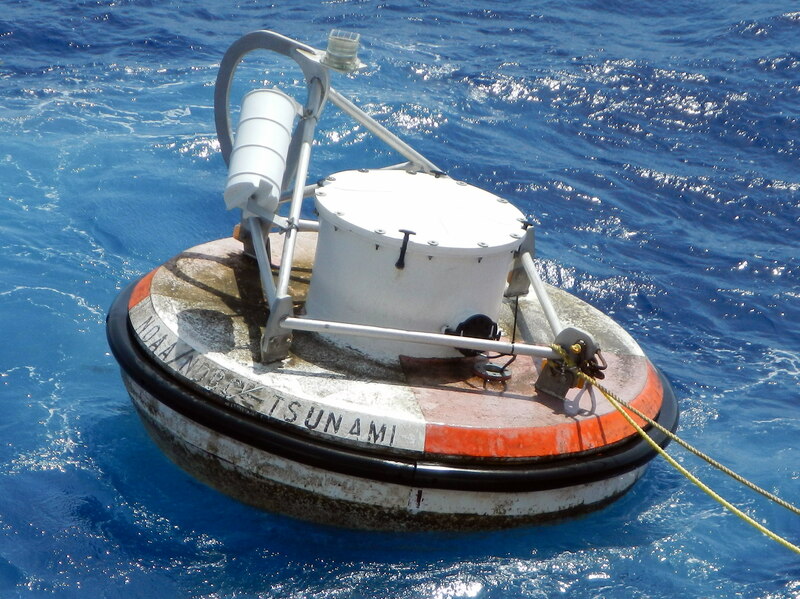 The buoy is an integral part of the U.S. early tsunami detection system. 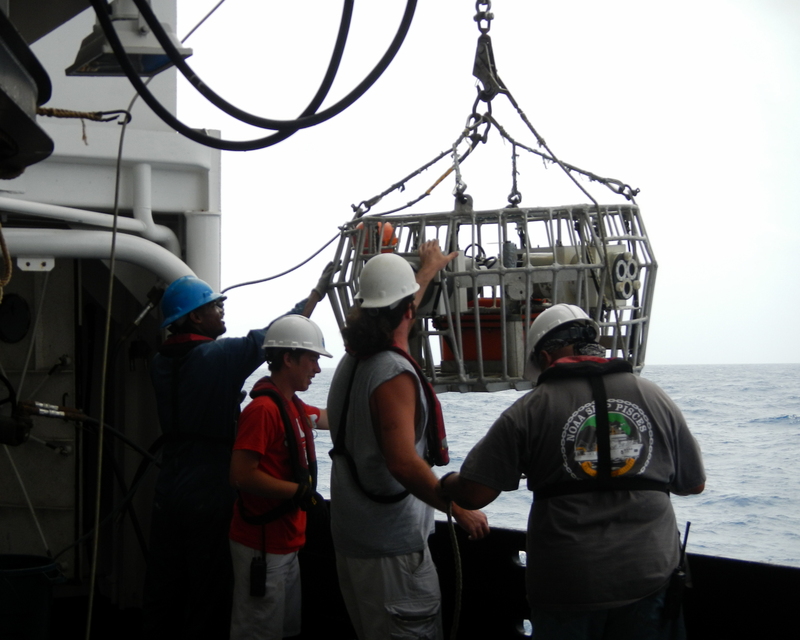 The program began in 2001 with six buoys deployed along the U.S. coast. These buoys were specifically located along regions that had been historically affected by tsunami. 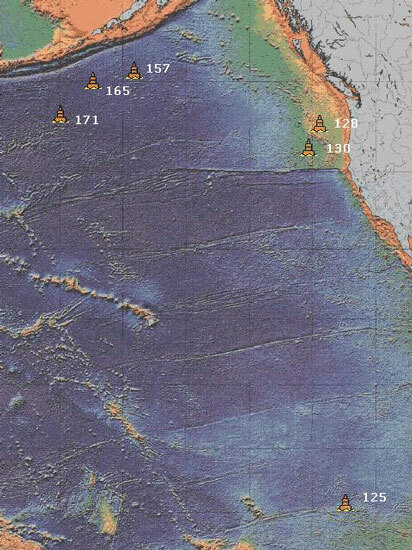 By 2008, the program had expanded to 39 stations located along the East Coast, West Coast, Hawaii, and the Western Pacific Ocean. It is a critical component of the NOAA Tsunami Program. The hull buoy we were retrieving, 2.6D70 from DART station 41421, went adrift after 5/12/2012 01Z. 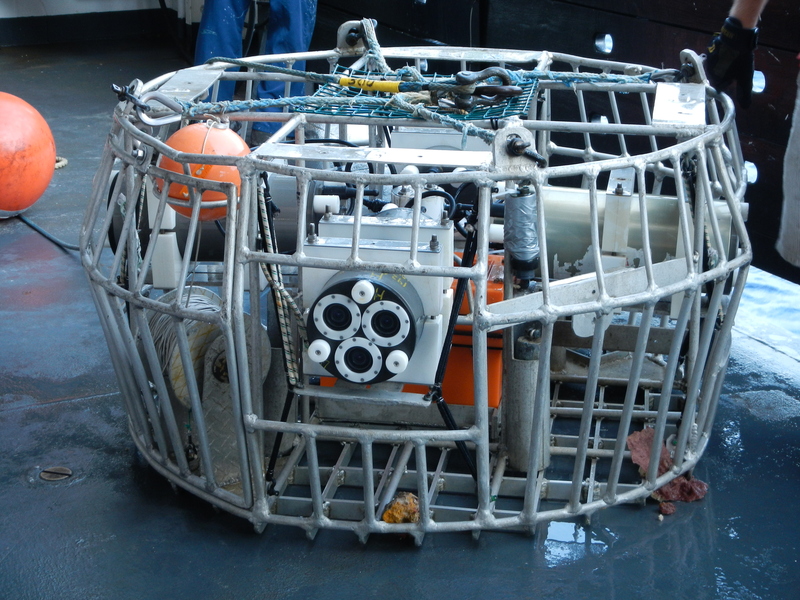 Since this type of equipment is very expensive to produce (around $60,000/buoy) and expensive to retrieve (another ~$20,000) it was the logical choice to swing a little out of our way to retrieve it on our journey back to Mayport. 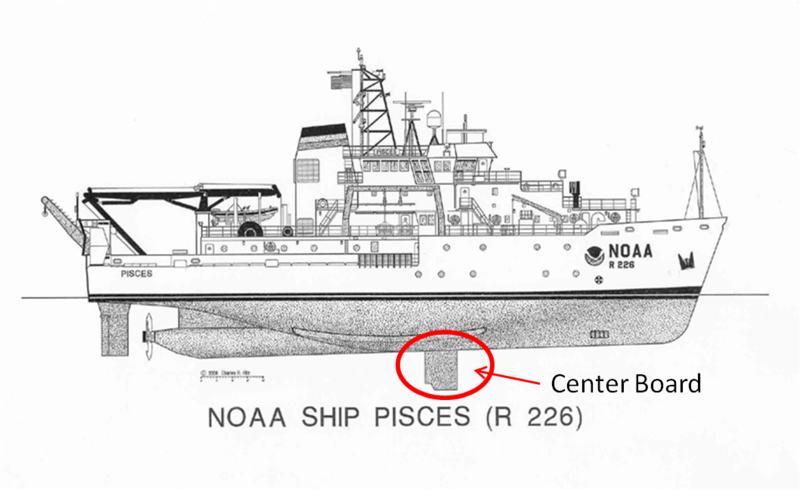 The NOAA ship Pisces is primarily a fishing vessel; therefore, logistical planning is different for retrieval from this ship than it would be for a ship specifically designed for this type of equipment. Once the buoy was sighted, the ship’s Commanding Officer (CO) Fischel; Junior Officer, Ensign Doig; Fisherman and Medical Officer, Ryan Harris; and Chris Zacharias, Junior Engineer, boarded the ship’s small boat and went to inspect the buoy. Ensign Doig got in the water with a snorkel mask to see how much, if any, chain or cable was trailing the buoy. Depending on what was attached, it would pose an additional concern when retrieving the buoy. Once the crew members were able to attach the buoy to a line, they towed it toward the Pisces where they attached the tow rope to the crane. 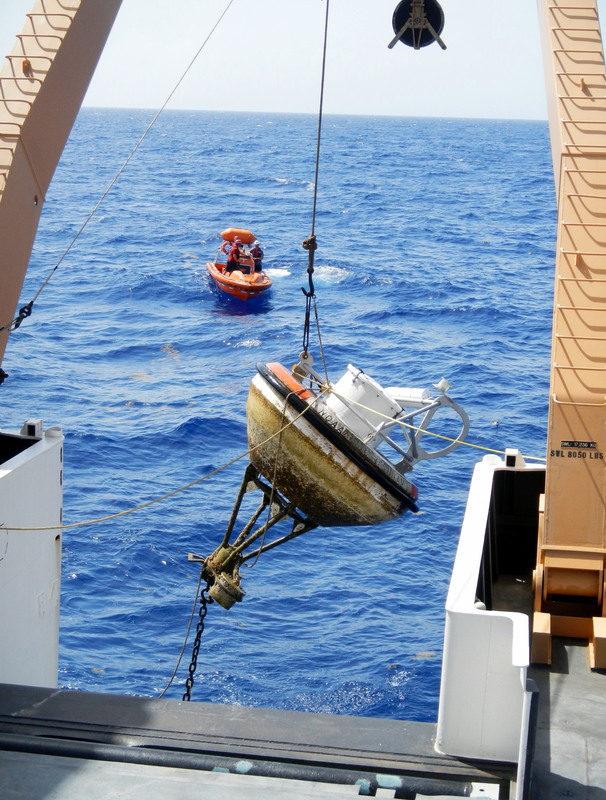 Retrieving the buoy proved to be a much easier endeavor than dropping the anchor. Hauling the DART buoy onto the deck of the Pisces. 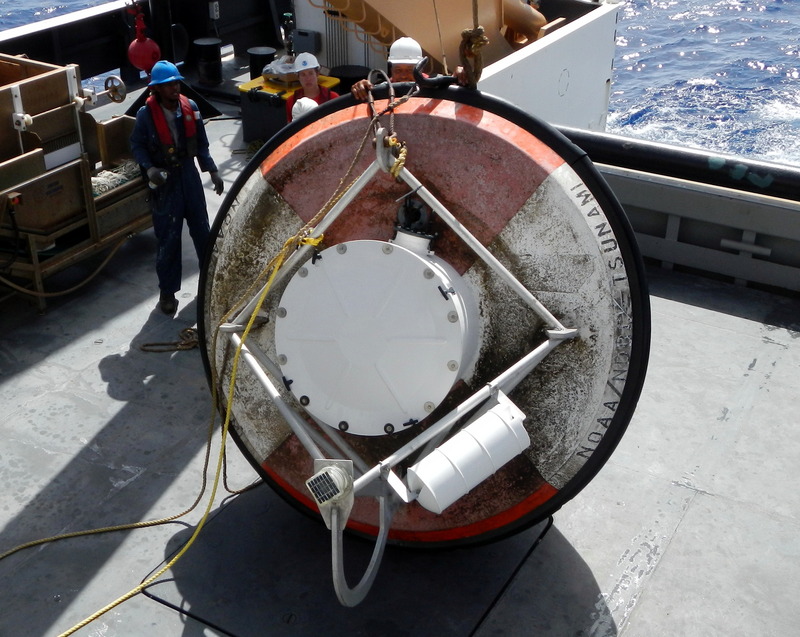 Once the buoy was on deck, it had to be strapped down to prevent it from rolling around and becoming a safety concern. A couple of strong chains fit the bill. 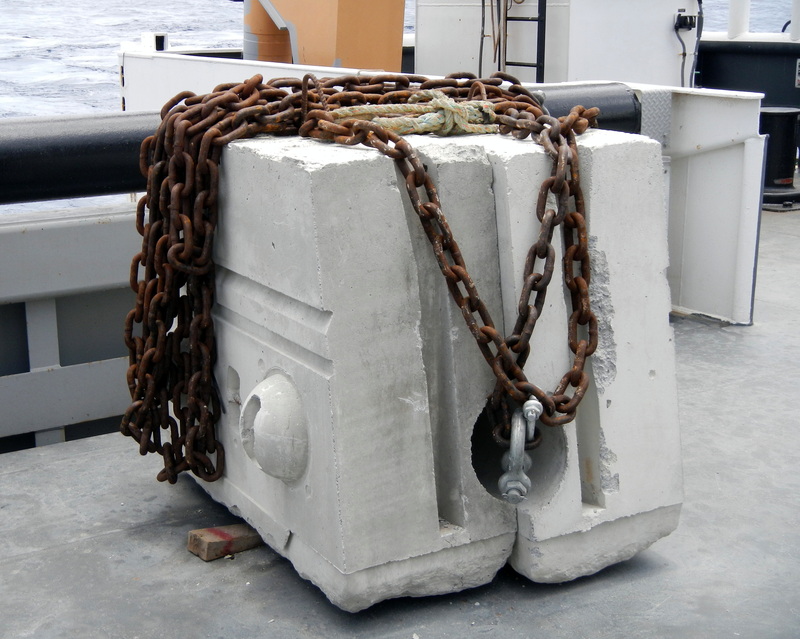 DART buoy prior to being secured to the deck. After is was secured, a couple of the deck hands set to work scraping off the organisms that had taken up residence on the submerged portion of the buoy. 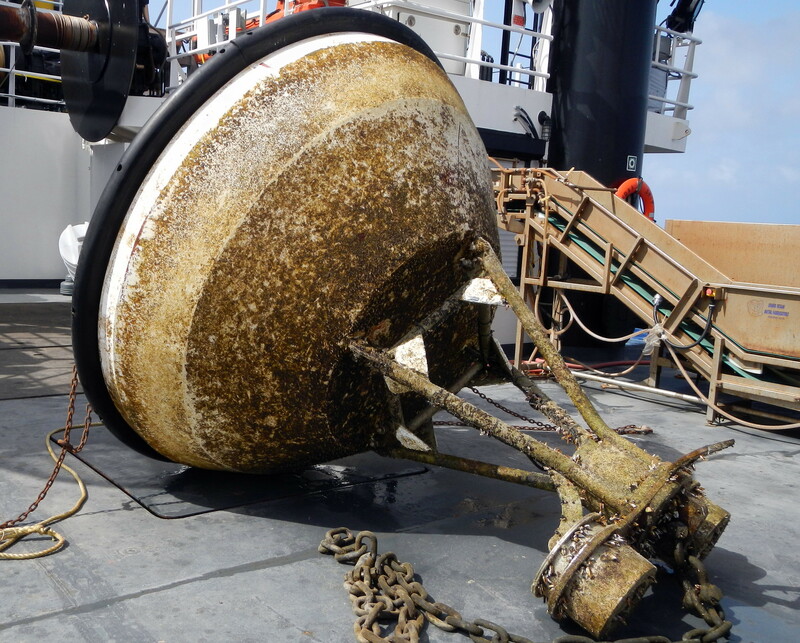 It is much easier to do this while the buoy is still wet; after is dries, the algae and mollusks encrusted on the outside as well as the crabs and brittle stars hiding in the nooks and crannies would in essence, be cemented onto it. Underside of the DART buoy coated with algae and small marine organisms. 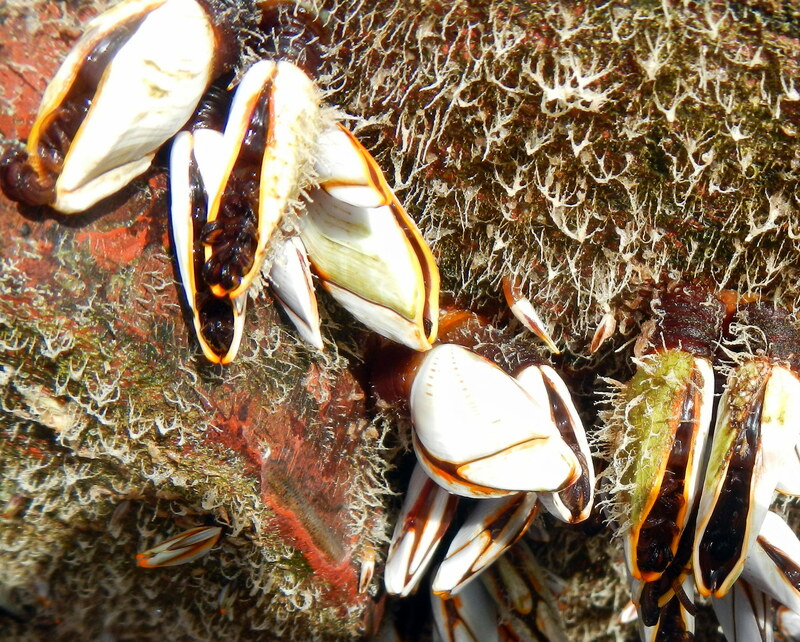 Mollusks attached to the underwater portion of the DART buoy. 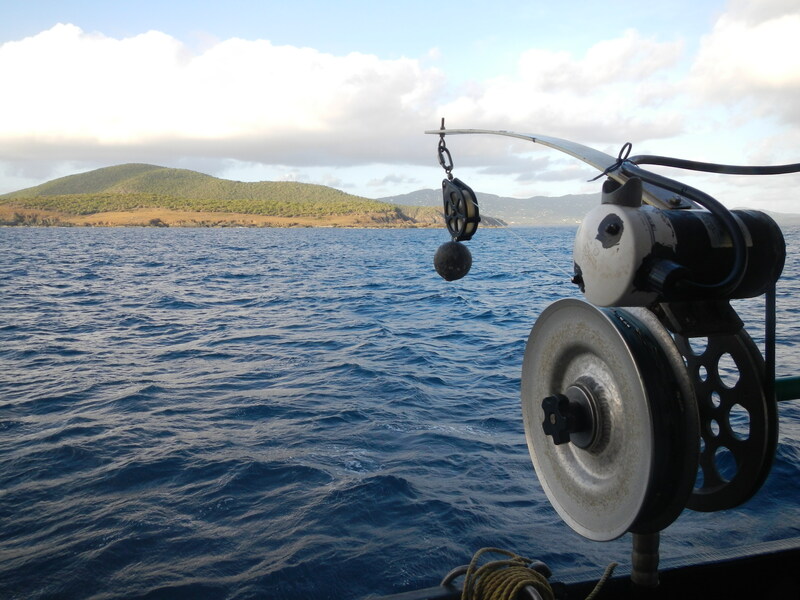 Once we arrived at the buoy, we took a bit of time to fish for our dinner. In just a short period, we had caught enough for dinner. We caught a few yellowfin tuna, a mahi-mahi, and a couple of rainbow runners. The crew has been fantastic; Garet Urban, the Chief Engineer, allowed me to use his fishing rod so that I could try and catch a fish. 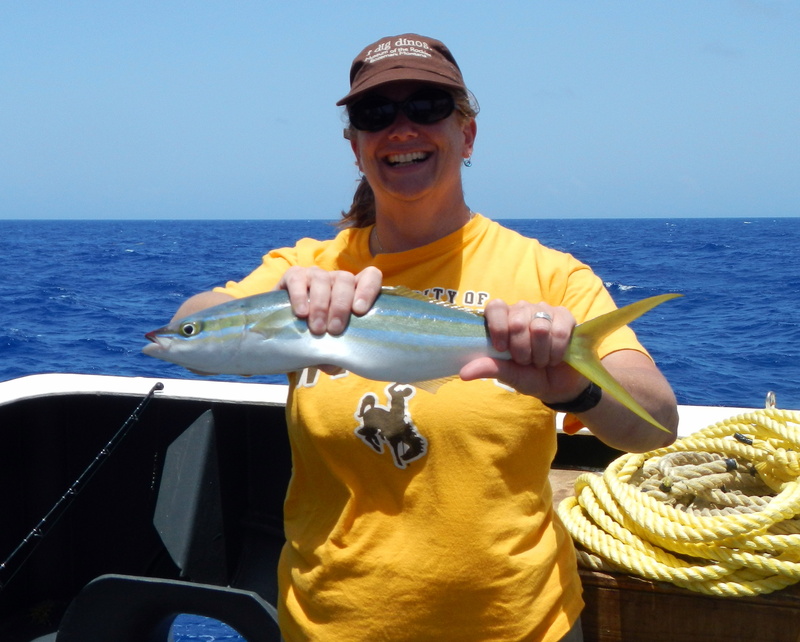 I got lucky and after only a couple of casts, I caught a rainbow runner! I don’t think I’ve ever had such fresh fish for dinner; it was fantastic! Here I am with the rainbow runner I caught. Today I said goodbye to the scientists. They are either flying home today or early tomorrow morning. This particular research cruise is over, although each of them have several cruises in the upcoming months. I am continuing on with the ship to their next port at Mayport, Florida. 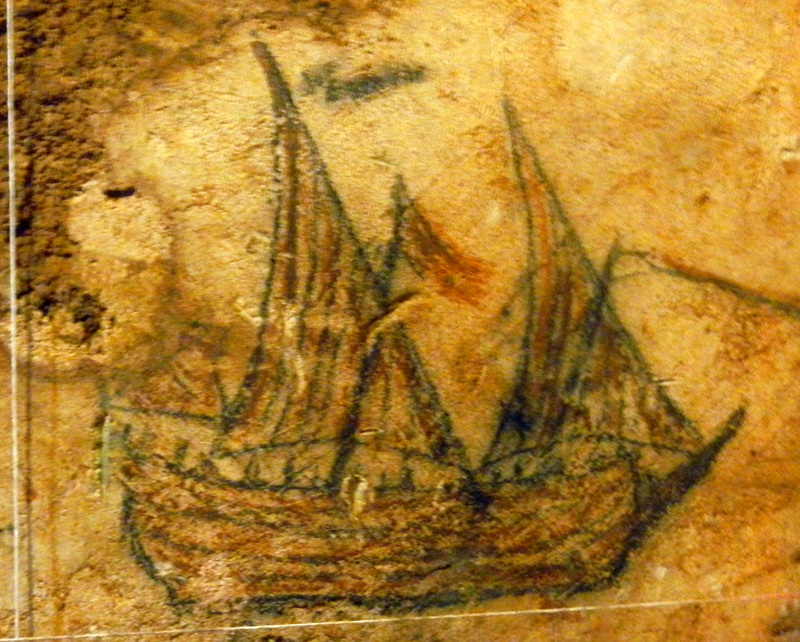 Originally, the ship was going to be in port in San Juan, Puerto Rico for two days. Now, because of a DART (Deep-ocean Assessment and Reporting of Tsunamis) buoy retrieval in the Atlantic, only one day is planned. The crew members are planning a variety of activities for this one day that range from catching up on much needed sleep (many of the night crew will be transitioning back to day shift), shopping, and sightseeing/adventure tours. We arrived in San Juan around 9:30 last night. We had to wait at the sea buoy for a cruise ship to come out of the harbor before we could proceed to our berth. We docked at Navy Frontier Pier, or pier 14. The next morning, I set out to explore Old San Juan. Because we had docked further down the harbor than initially expected, I had about a mile long walk to get to Old San Juan. As I neared the town, the buildings began to change from modern to an older style. The first sign I was approaching Old San Juan was sighting the Castillo San Cristóbal. It is one of the two fortresses that make up the San Juan National Historic Site. The San Juan National Historic Site is managed by the United States National Park Service and is a UNESCO World Heritage Site. 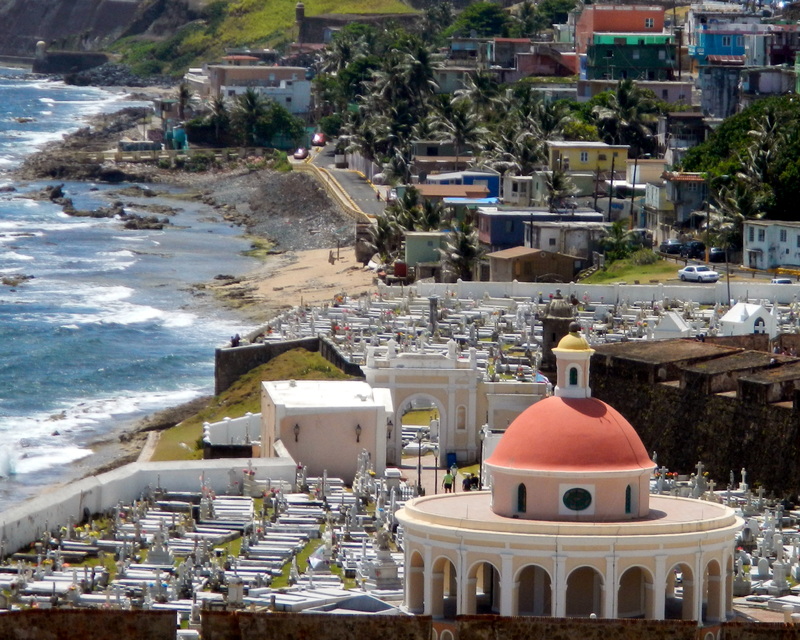 Due to its location on the western edge of the Caribbean, Puerto Rico was key to Spain’s West-Indies claim. It is sometimes referred to as the “Gibraltar of the Caribbean”. The larger fortress is called Castillo San Felipe del Morro. If you’ve ever seen pictures of the San Juan and the fortress on the ocean, most likely, you’ve seen this one. 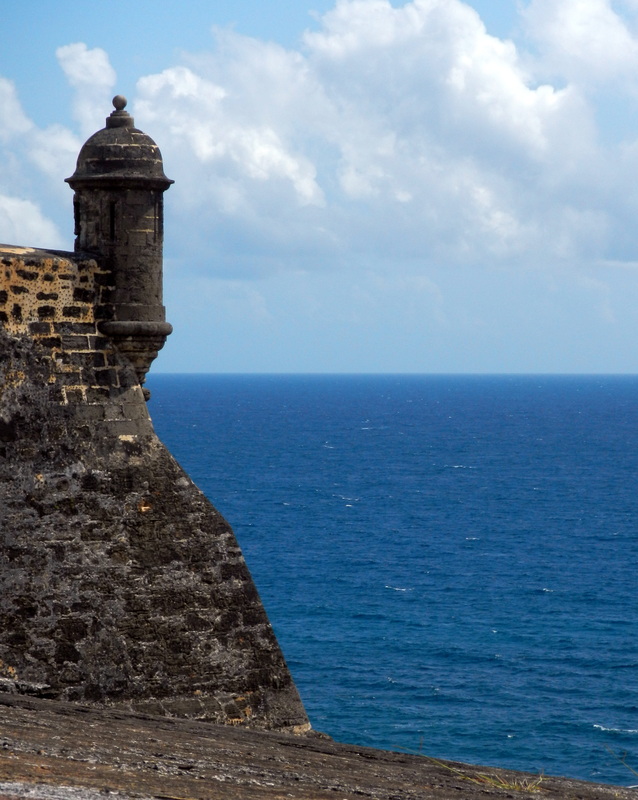 El Morro was designed to protect the city of San Juan from threats coming from the ocean, while San Cristóbal protected the city from land attacks. 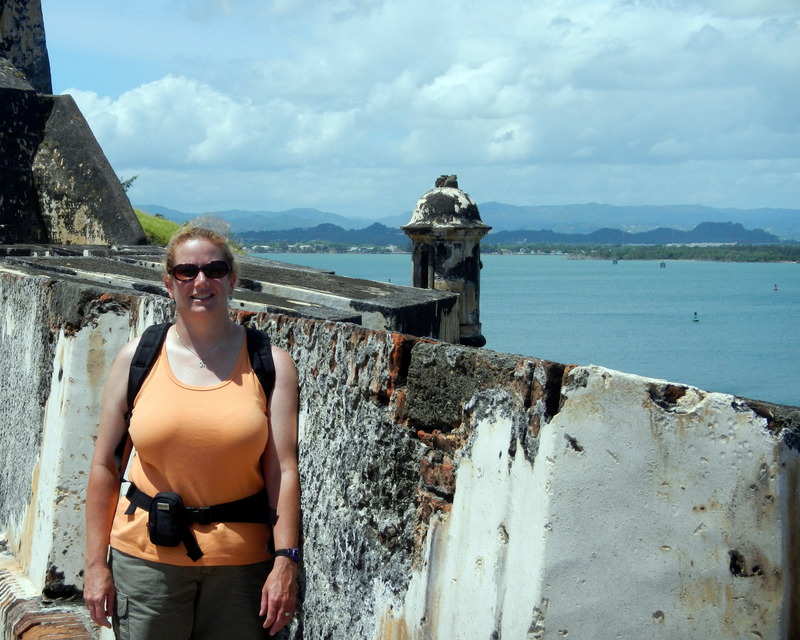 Here I am at El Morro with San Juan in the background. I spent some time touring San Cristóbal before walking along the remains of the fortified wall linking the two fortresses. El Morro was very busy and the grounds were filled with kids at summer camp flying their kites on the grounds. This, too, was a brief stop since I only had 4 hours to explore Old San Juan before my afternoon adventure. After the fortresses, I was making my way down the hill to the town, and stopped to visit with a San Juan resident, Luis Serrano-Lugo. He volunteered to show me his town and tell me some of the history; of course, who could refuse a local tour guide!? Old San Juan is a very colorful town – houses and buildings are painted in bright pinks, greens, yellows, and blues. They are tall with ornate wrought iron balconies and heavy wooden doors and shutters. 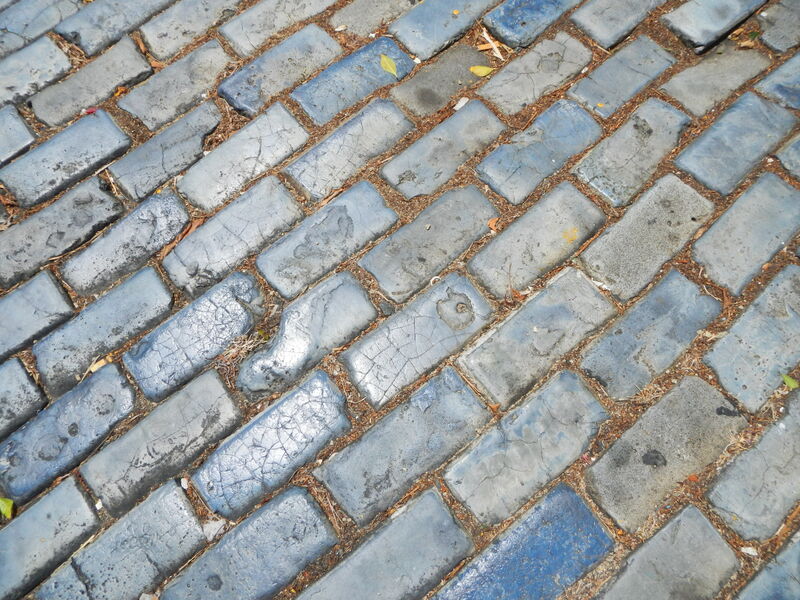 The most interesting part to me, were the blue bricks making up the streets. These bricks came over on Spanish ships as ballast (weight to keep the ship stable in the water and at the desired draft) and upon their return, when they were loaded with gold, they left the bricks behind. 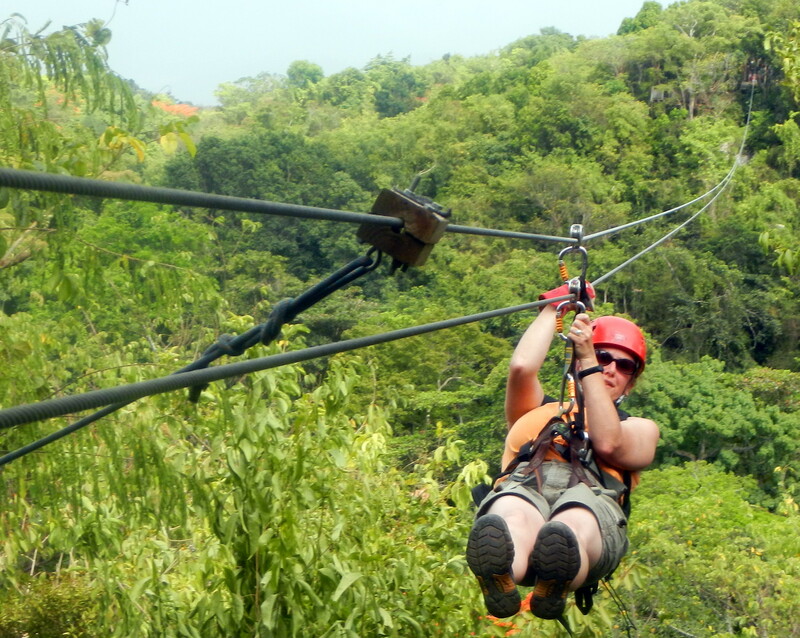 After my delightful tour with Luis, I headed off to my next adventure, ziplining in the rainforest! The tour company I had booked for the tour picked me up at Plaza Colon in Old San Juan and off we headed to pick up other participants on our way to the rainforest. The tour I took consisted of four components: a short kayak through a water lily laden lake, hiking through the rainforest, six canopy bridges, and five ziplines. 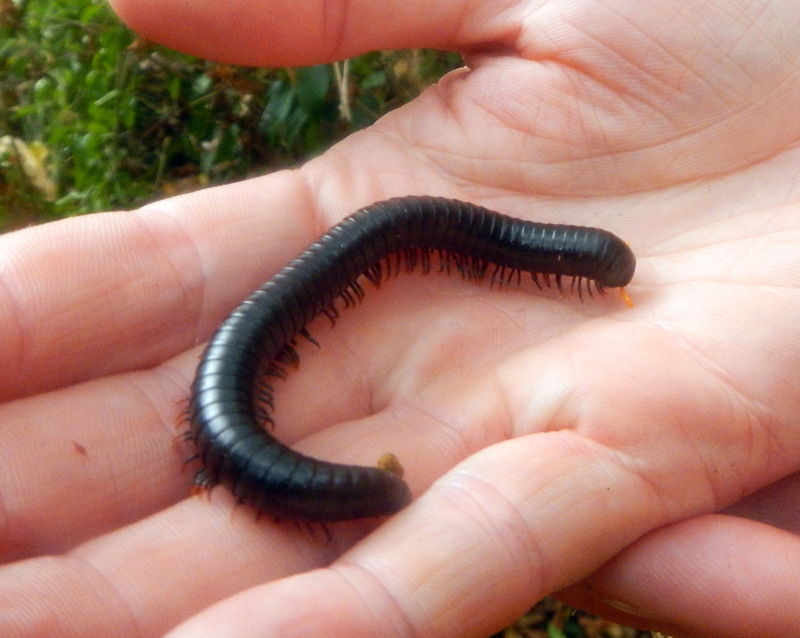 Along the way we saw termite mounds, birds, iguana, and my favorite – a millipede! It was an unforgettable experience to be able to travel through the air looking at the surrounding rainforest. There’s nothing like whizzing through the rain 205 feet above the ground to make you feel alive! 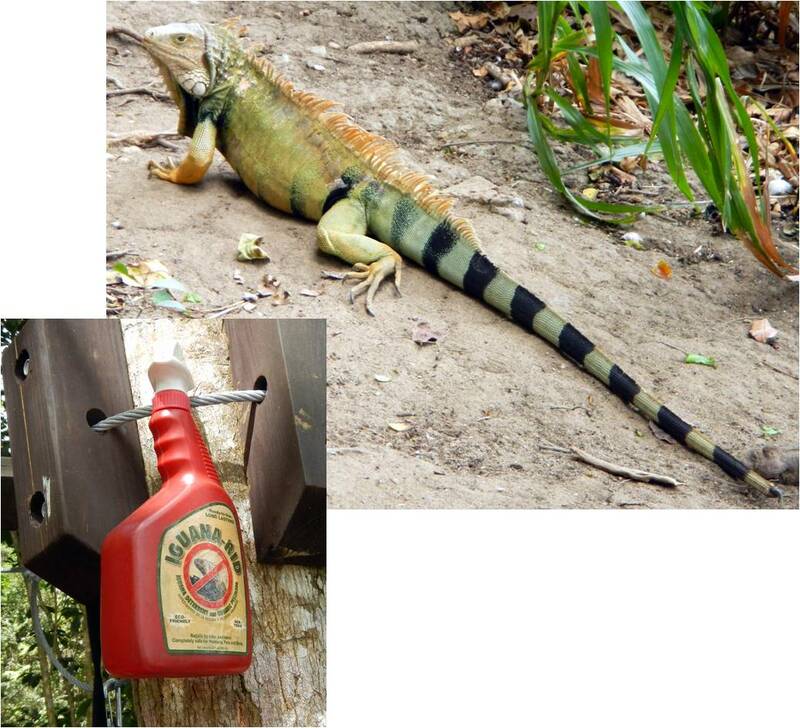 Iguana and bottle of Iguana-rid used to keep them off the canopy bridges and zipline platforms. This evening, Kevin Rademacher, the Chief Scientist, and I went to dinner in Old San Juan at Raices for a traditional Puerto Rican dinner of mofongo. This is a very traditional dish of green plantains fried up with lots of garlic and fried pork skin. 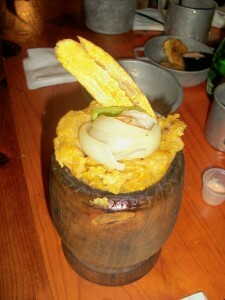 It is mashed together in a pilon (wooden mortar and pestle). When the pestle is pulled out of the mortar, the depression left behind is filled with some type of meat, usually in a gravy sauce. I had mine filled with shrimp in a mojo isleno style. Again, thank you Kevin for helping me have such a memorable trip! Alright, so I’ve promised to talk about the fish. 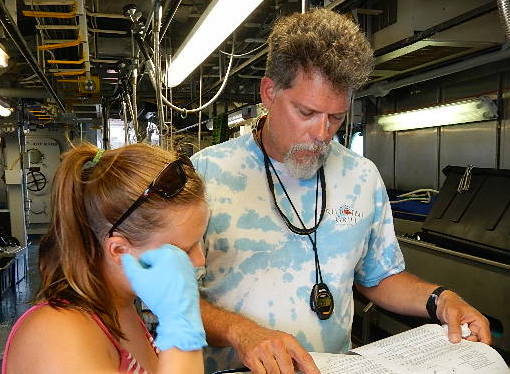 Throughout the science portions of the cruise, the scientists have not been catching the anticipated quantities of fish. 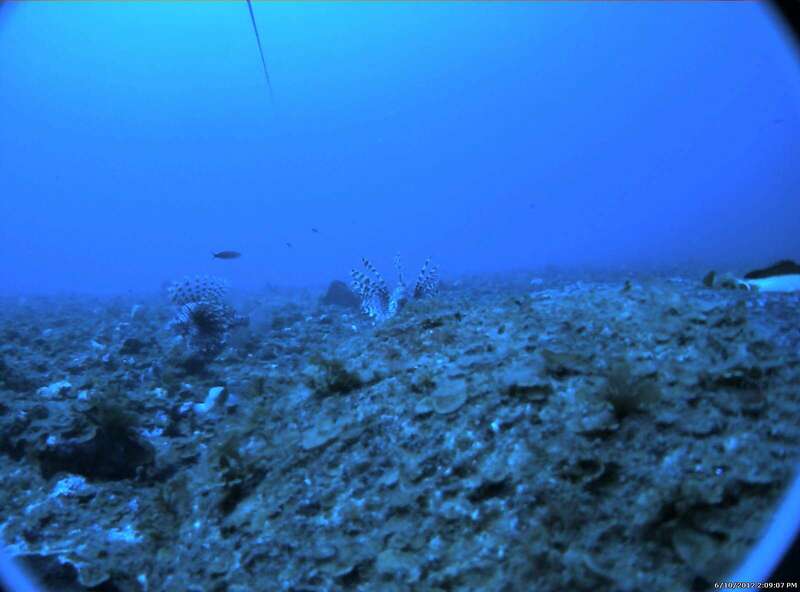 There are several lines of thought as to why: maybe the region has experienced overfishing; possibly the sampling sites are too shallow and deeper water fish may be more likely to bite; or they might not like the bait (North Atlantic mackerel) since it is not an endemic species/prey they would normally eat. So far, the night shift has caught more fish than the day shift that I’m on. Today, we have caught five and a half fish. The half fish was exactly that – we retrieved only the head and it looked like the rest of the body had been consumed by a barracuda! 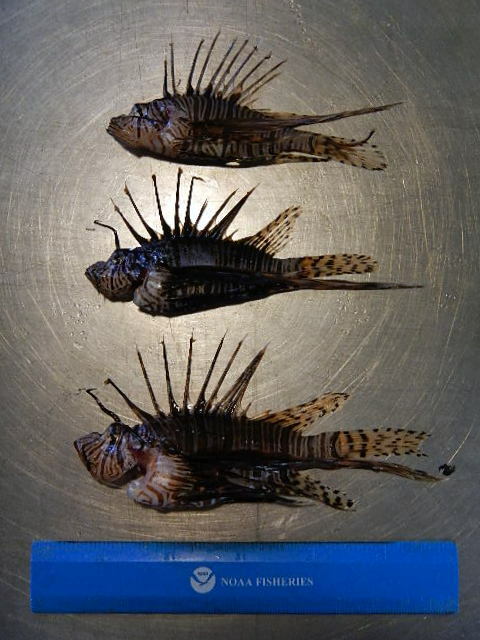 These fish were in the grouper family and the snapper family. Blackfin snapper (Lutjanus buccanella). This little guy was wily enough to sneak into the camera array and steal some squid out of the bait bag! 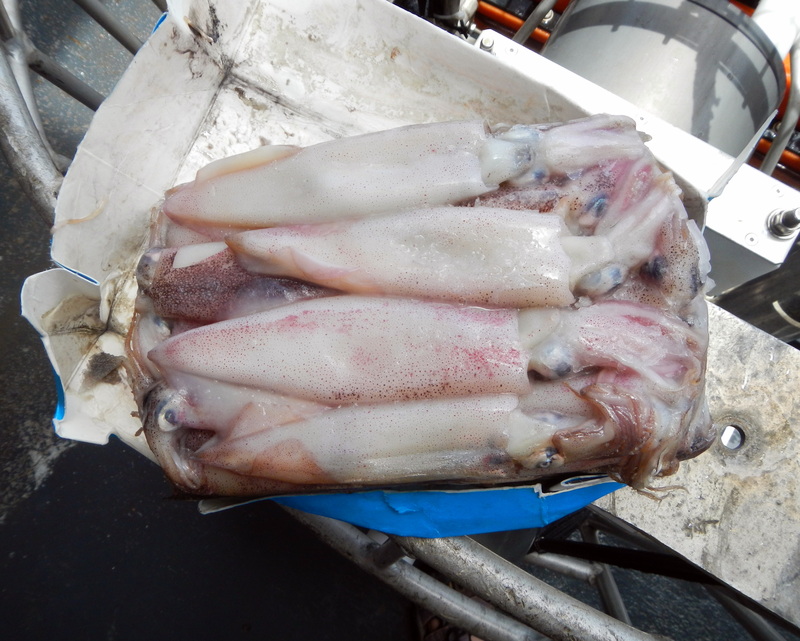 The contents of his stomach – cut up squid – can be seen to the left between the forceps and his head. Once the fish have been caught, there are several measurements that must be made. To begin, the fish is weighed to the nearest thousandth (three decimal places) of a kilogram. In order to make sure the weight of the fish is accurate, the scale must be periodically calibrated. Then there are several length measurements that are made: standard length (SL), total length (TL) and depending on the type of fish, fork length (FL). To make these measurements, the fish is laid so that it facing toward the left and placed on a fish board. The board is simply a long plank with a tape measure running down the center. It insures that the fish is laid out flat and allows for consistent measurement. Standard length does not measure the caudal fin, or tail. 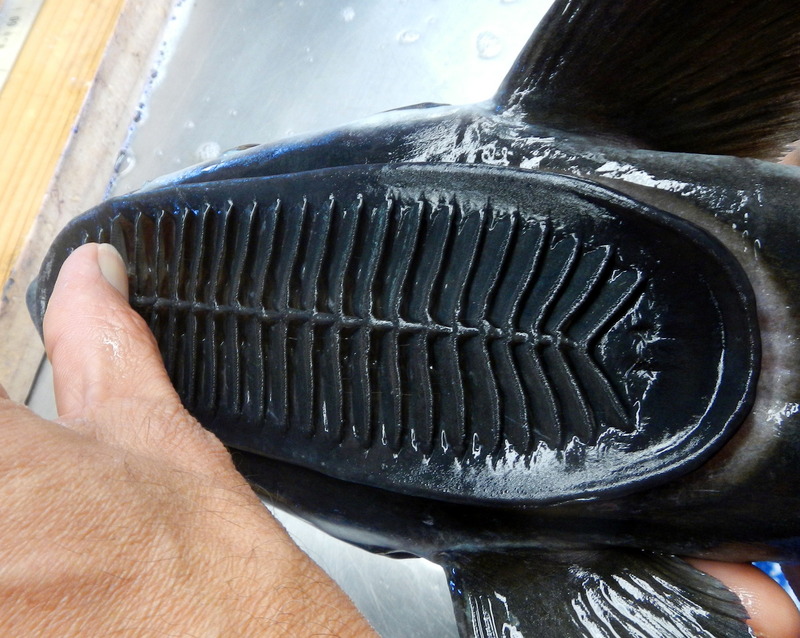 It is measured from the tip of the fish’s head and stops at the end of the last vertebra; in other words, if the fish is laying on its side, and you were to lift the tail up slightly, a crease will form at the base of the backbone. This is where the standard length measurement would end. Total length is just as it sounds – it is a measurement of the entire length (straight line) of the fish. Fork length is only measured if the type of fish caught has a forked tail. If it does, the measurement begins at the fish’s snout and ends at the v-notch in the tail. 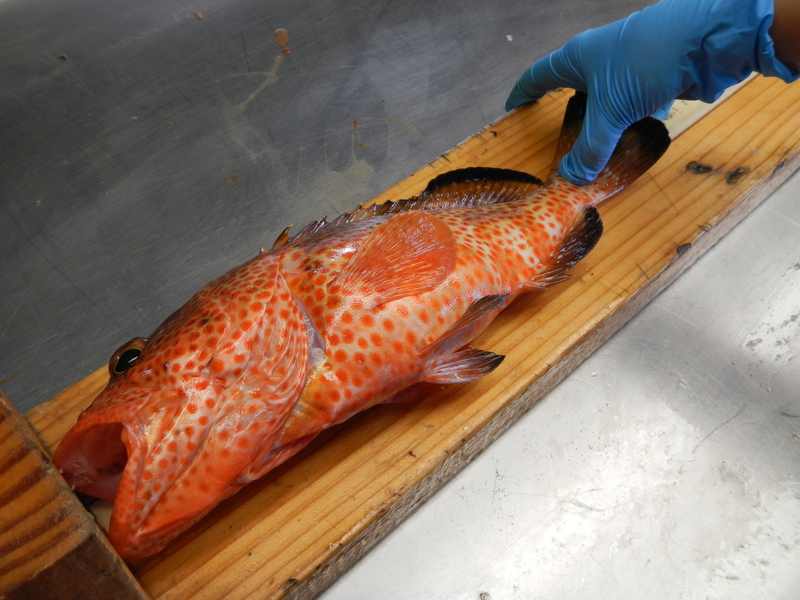 Red hind (Epinephelus guttatus) on the fish board being measured for standard length. Ariane’s thumb is on the crease marking the end of its backbone. 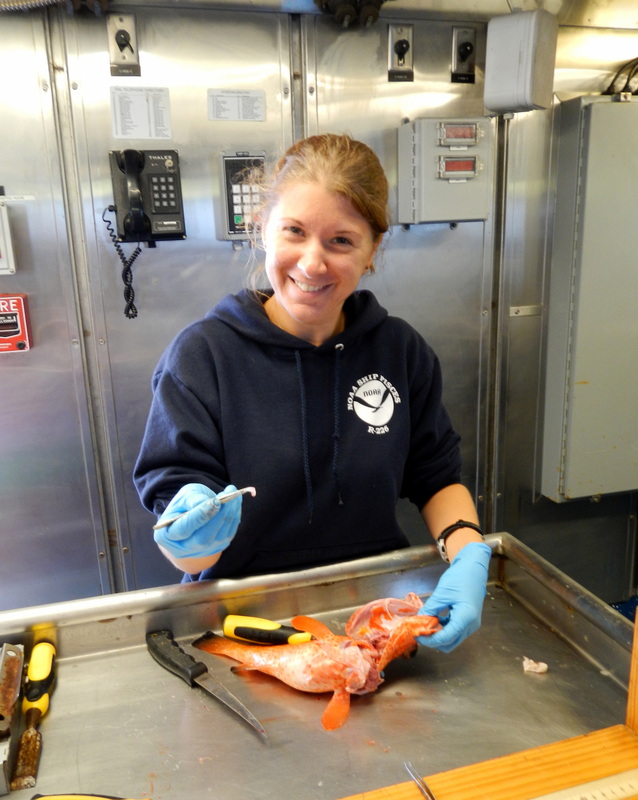 Once the physical measurements are made, the otoliths must be extracted and the fish sexed. You’re probably anxious to learn if you selected the right answer on the previous post’s poll – “What do you think an otolith is?” An otolith can be thought of as a fish’s “ear bone”. It is actually a structure composed of calcium carbonate and located within the inner ear. All vertebrates (organisms with backbones) have similar structures. They function as gravity, balance, movement, and directional indicators. 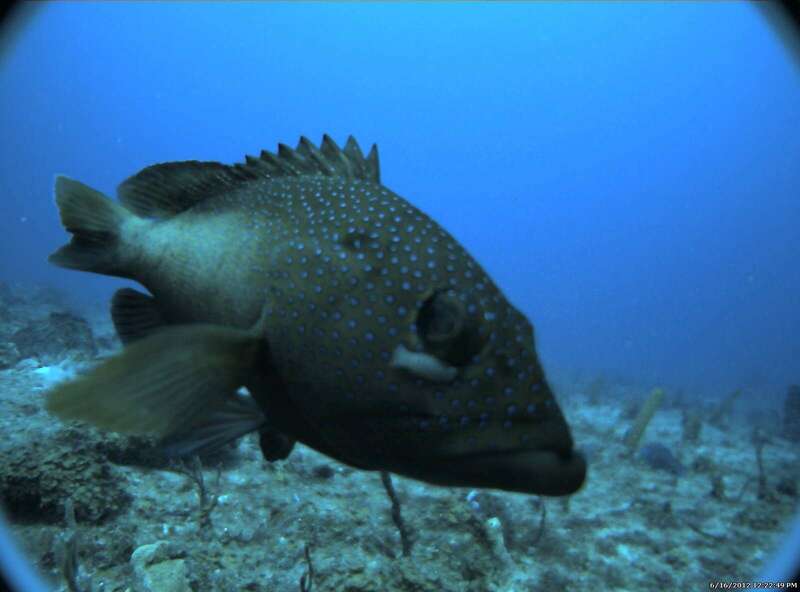 Their presence helps a fish sense changes in horizontal motion and acceleration. 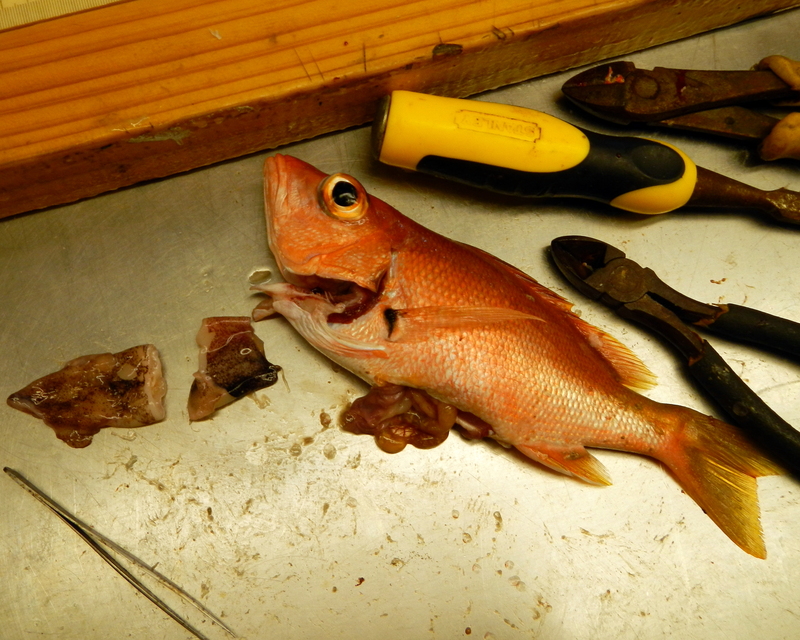 In order to extract the otoliths, the fish must be killed. 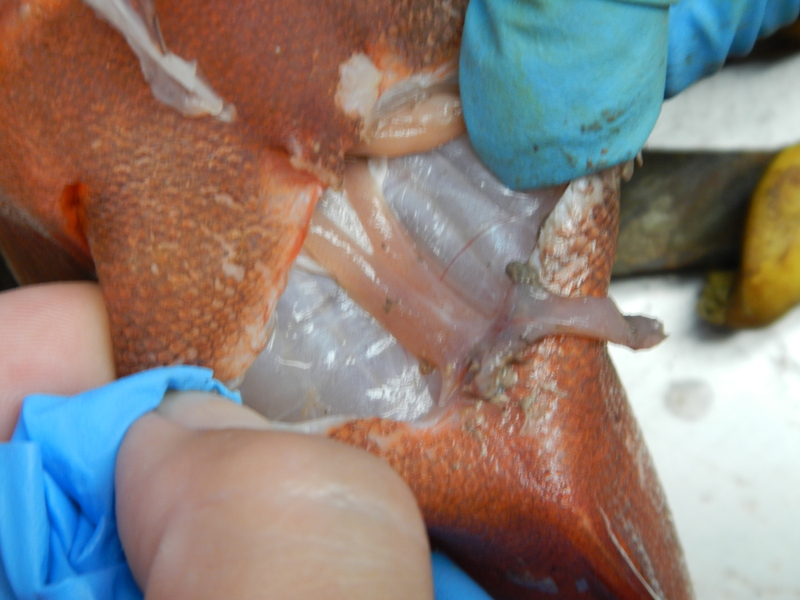 Once the fish has been killed, the brain case is exposed and peeled back. The otoliths are in little slits located in the underside of the brain. It takes a delicate touch to remove them with a pair of forceps (tweezers) because they can easily break or slip beyond the “point of no return” (drop into the brain cavity where they cannot be extracted). 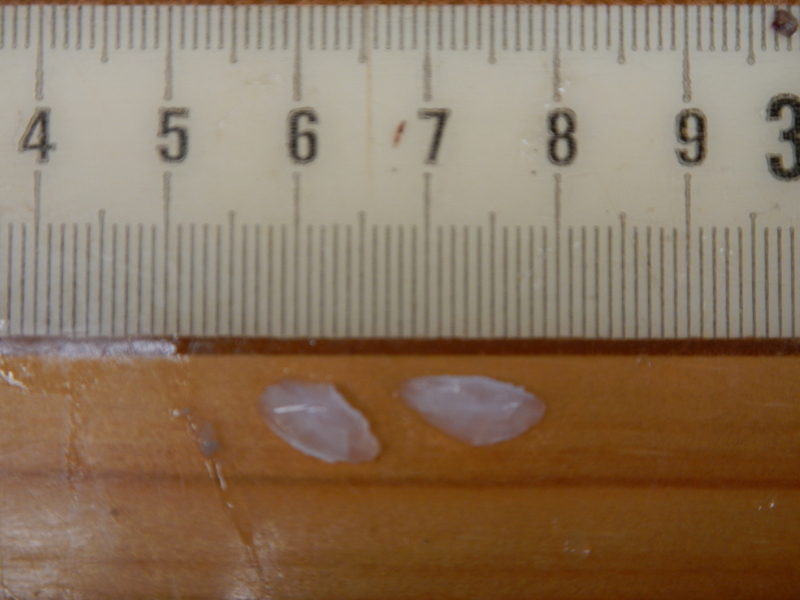 Otoliths are important scientifically because they can tell many important things about a fish’s life. Their age and growth throughout the first year of life can be determined. Otoliths record this information just like tree ring record summer/winter cycles. 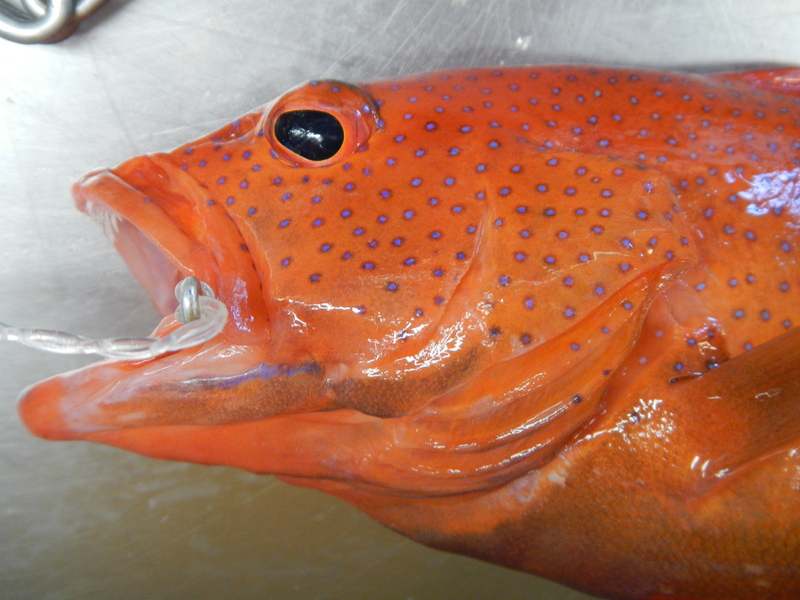 More complex measurements can be used to determine the date of hatch, once there are a collected series of measurements, spawning times can be calculated. A cross-section of an otolith under a microscope. The rings are used to determine age and other life events. Source: Otolith Research Laboratory, Bedford Institute of Oceanography, Dartmouth, Nova Scotia, Canada. Because they are composed of calcium carbonate (CaCO3), the oxygen component of the chemical compound can be used to measure stable oxygen isotopes; this is useful for reconstructing temperatures of the waters the fish has lived in. Scientists are also able to look at other trace elements and isotopes to determine various environmental factors. Extracted otoliths. Often they are around 1 cm long, although the larger the fish, the slightly larger the otolith. Ovaries of a coney (grouper family). These are the pair of flesh colored tubular structures running down the center of the fish. Today is my birthday, and I can’t think of a better place to spend it! What a treat to be having such an adventure in the Caribbean! This morning, we were on our first bandit reel survey of the day, and the captain came on over the radio system, announced my birthday and sang Happy Birthday to me. Unbeknownst to me, my husband, Dave, had emailed the CO of the Pisces asking him to wish me a happy birthday. We’ve had a very successful day (compared to the past two days) and have caught many more fish – 5 1/2 to be exact. The most exciting part was that I caught two fish on my bandit reel! They were a red hind and blackfin snapper (see the photos above). What a great birthday present! My birthday fish! 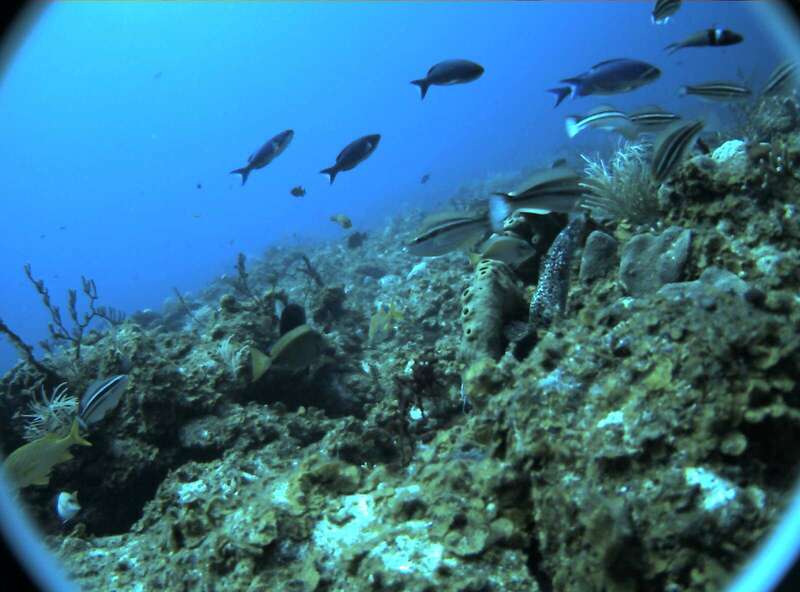 The blackfin snapper is on the left and the red hind on the right. I even got a birthday kiss from the red hind! Last night (6/17) for Father’s Day, we had an amazing dinner: filet mignon, lobster, asparagus, sweet plantains, and sweet potato pie for dessert! 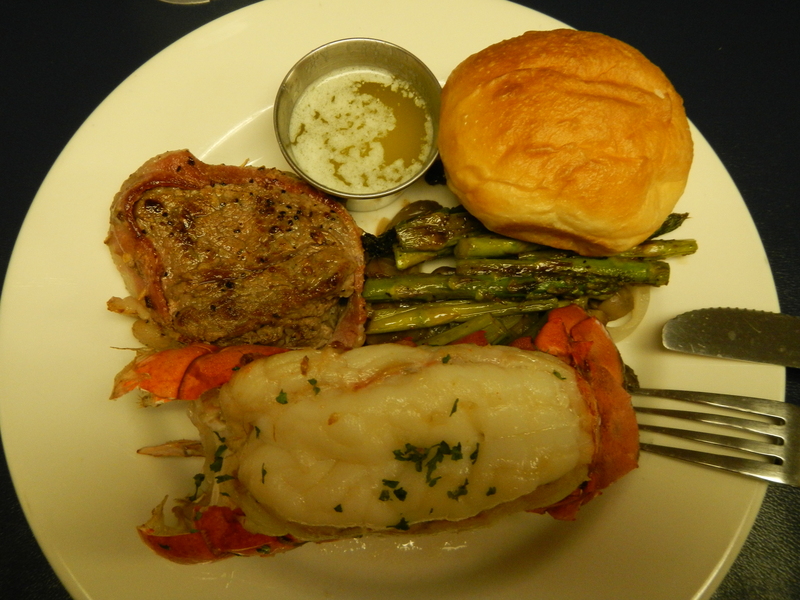 Since it was my birthday the following day (6/18), and one of the scientists doesn’t like lobster, I had two tails! What a treat! Our best catch of the day came on the last bandit reel cast. 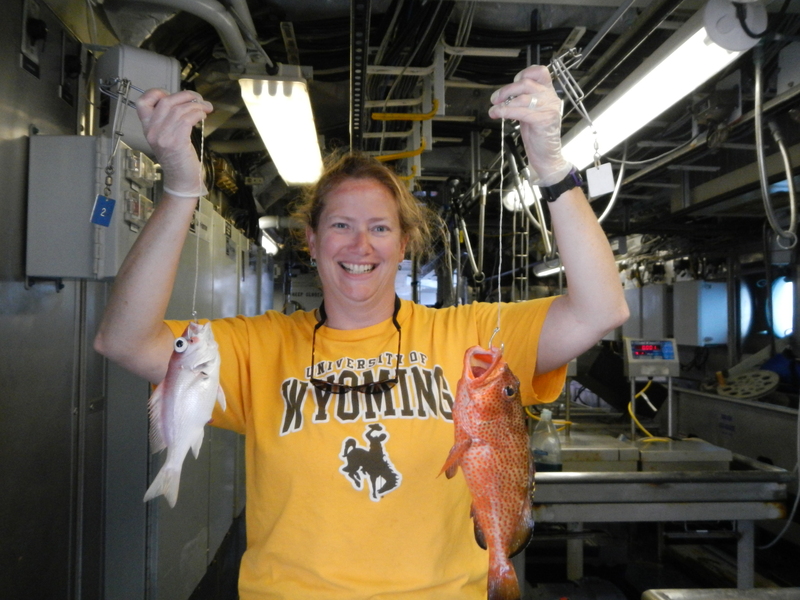 Joey Salisbury (one of the scientists) caught 5 fish: 4 blackfin snapper and 1 almaco jack; while Ariane Frappier (another scientist) caught 3 – 2 blackfin and 1 almaco jack. This happened right before dinner, so we developed a pretty good assembly line system to work them up in time to eat. Dinner was a nice Chinese meal, but between the ship beginning to travel to the South coast of St. Thomas and working on the computer, I began to feel a touch seasick (not the best feeling after a large meal!). I took a couple of meclazine (motion sickness medication) and still felt unwell (most likely because you’re supposed to take it before the motion begins). My roommate, Kelly Schill, the Operations Officer, made me go to bed (I’m in the top bunk – yikes! ), gave me a plastic bag (just in case! ), and some saltine crackers. After 10 hours of sleep, I felt much, much better! LU: What are your job duties as the Director of Fish and Wildlife? RP: I manage fisheries/wildlife resources and try to educate the population on how to better manage these resources to preserve them for future generations of the U.S. Virgin Islands. 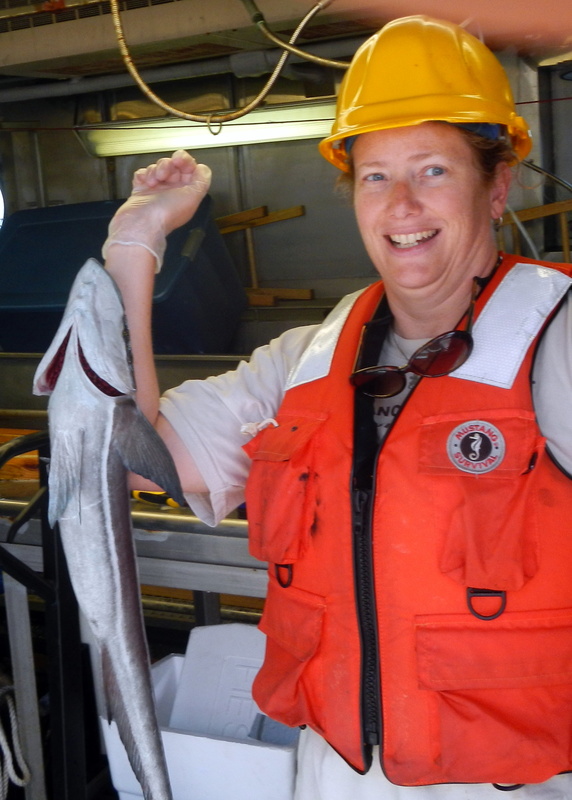 LU: When did you first become interested in oceanography? 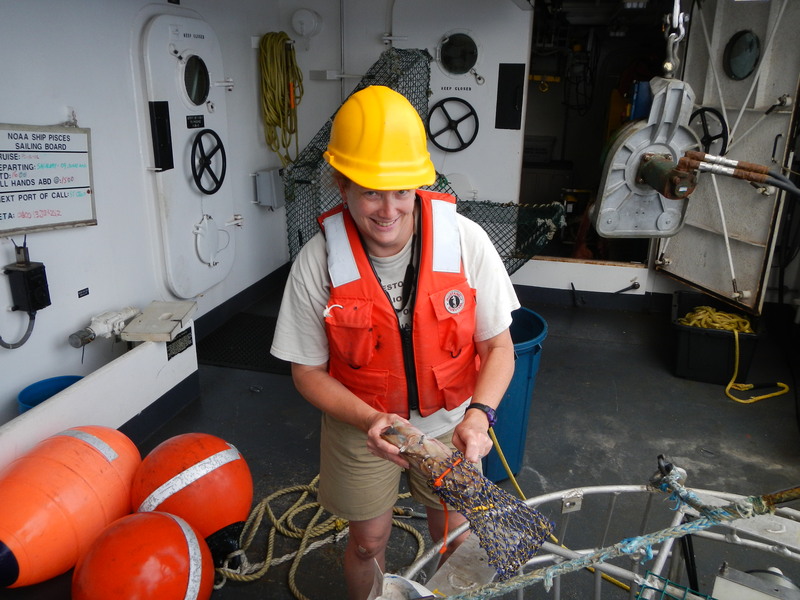 RP: I’m not really an oceanographer, but more of a marine scientist and wildlife biologist. I got interested in this around 5-6 years old when I learned to swim and then snorkel for the first time. I really enjoyed observing the marine environment and my interest prompted me to want to see and learn more about it. LU: It’s such a broad field, how did you narrow your focus down to what you’re currently doing? RP: I took a marine science class in high school and I enjoyed it tremendously. 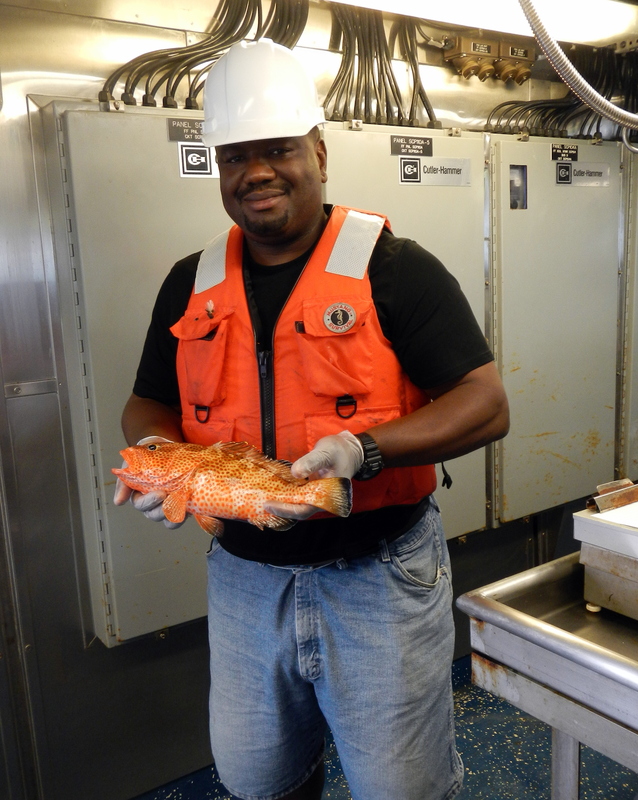 It made me seek it out as a career by pursuing a degree in Marine Science at Hampton University. Roy Pemberton holding a recently caught coney. RP: It is a challenge to manage fisheries and wildlife resources with respect to the socioeconomic and cultural nuances of the people. LU: What do you think is the biggest issue of contention in your field, and how do you imagine it will resolve? RP: Fisheries and coral reef management. We need to have enough time to see if the federal management efforts work to ensure healthier ecosystems for future generations. LU: What are some effects of climate change that you’ve witnessed in the reef systems of the U.S. Virgin Islands? RP: Temperatures have become warmer and the prevalence of disease among corals has increased. LU: In what areas of Marine Science do you foresee a lot of a career paths and job opportunities? RP: Fisheries management, ecosystem management, coral reef diseases, and the study of coral reef restoration. 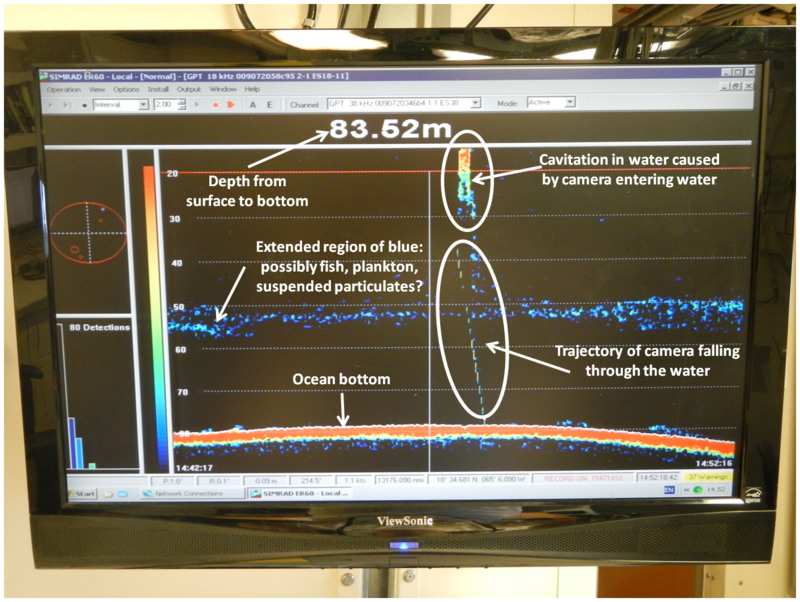 LU: Is there an area of Marine Science that you think is currently being overlooked, and why? RP: Marine Science management that takes into account cultural and economic issues. LU: What are some ideas a layperson could take from your work? RP: One tries to balance resource protection and management with the cultural and heritage needs of the population in the territory of the U.S. Virgin Islands. LU: If a high school student wanted to go into the fish/wildlife division of planning and natural resources, what kinds of courses would you recommend they take? LU: Do you recommend students interested in your field pursue original research as high school students or undergraduate students? If so, what kind? RP: I would suggest they study a variety of life sciences so they can see what they want to pursue. Then they can do an internship in a particular life science they find interesting to determine if they would like to pursue it as a career. Too many interesting people on the ship and so little time! I’m going to interview scientists as we continue on to San Juan, Puerto Rico. Once they leave, I’m continuing on to Mayport, Florida with the ship. 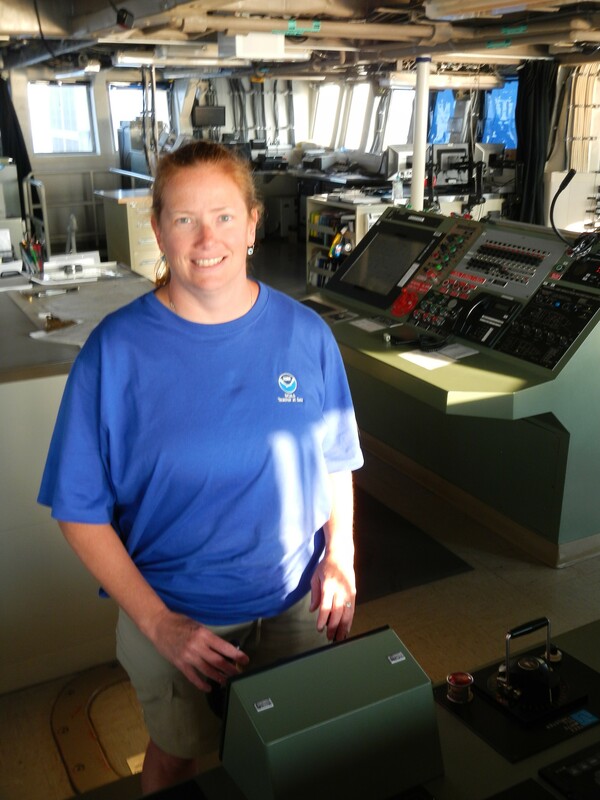 During this time, I’ll explore other careers with NOAA.